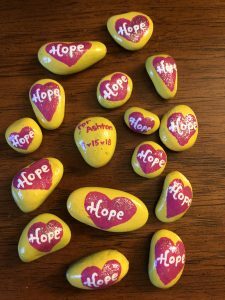 Four years ago, in the early years of my kindness journey, I stumbled across a blog post someone wrote about World Kindness Week. 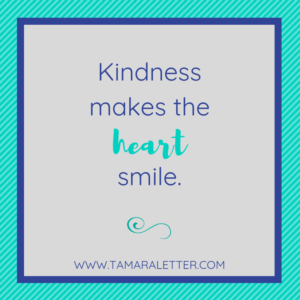 Inspired to embrace an entire week of kindness, I set about different acts of kindness for each day including simple, small acts that others might miss. I wrote a blog post about compliments, then continued to share other acts of kindness I completed, received, or witnessed. 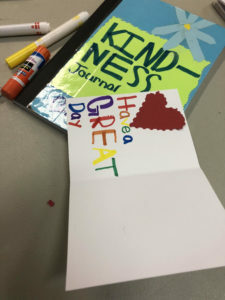 Since that time, I’ve learned that World Kindness Day (not week) is a real-deal thing, created in 1998 by the World Kindness Movement, and each year on November 13, I wake up absolutely giddy with joy knowing there are thousands of other people around the world sharing in kindness at the exact same time! One way that I kick off World Kindness Day is by thinking globally. 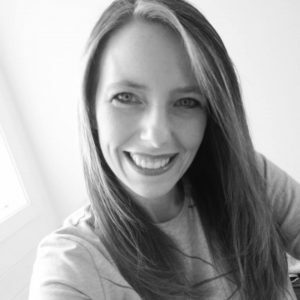 How can I make a positive impact on the world? That question alone is paralyzing if you get caught up in the enormity of it all. 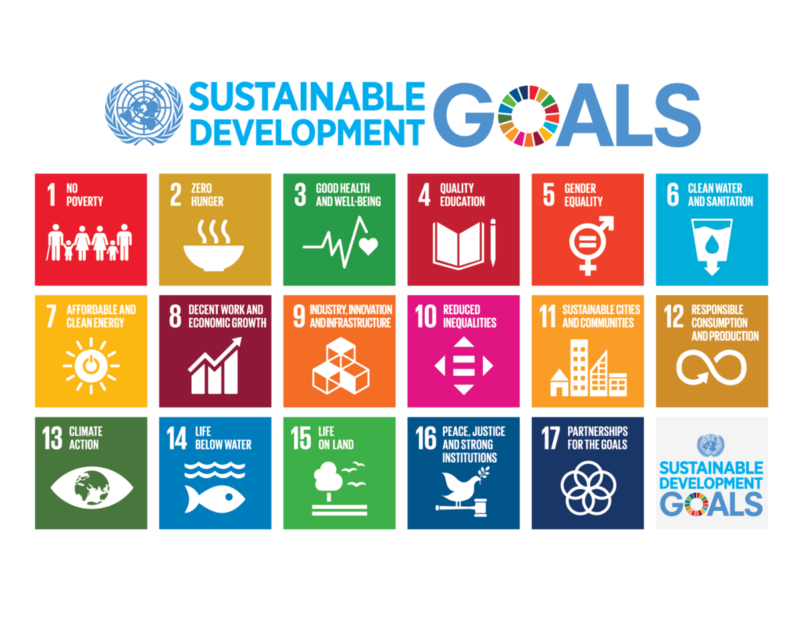 Positively impact the world? Who… me? Really? See, your small acts of kindness make a difference. They matter to someone else. They don’t have to be expensive and they don’t have to be elaborate. They simply need to come from the heart. So each year about this time, I start by filling three shoeboxes for Operation Christmas Child, (one in honor of each of my children). 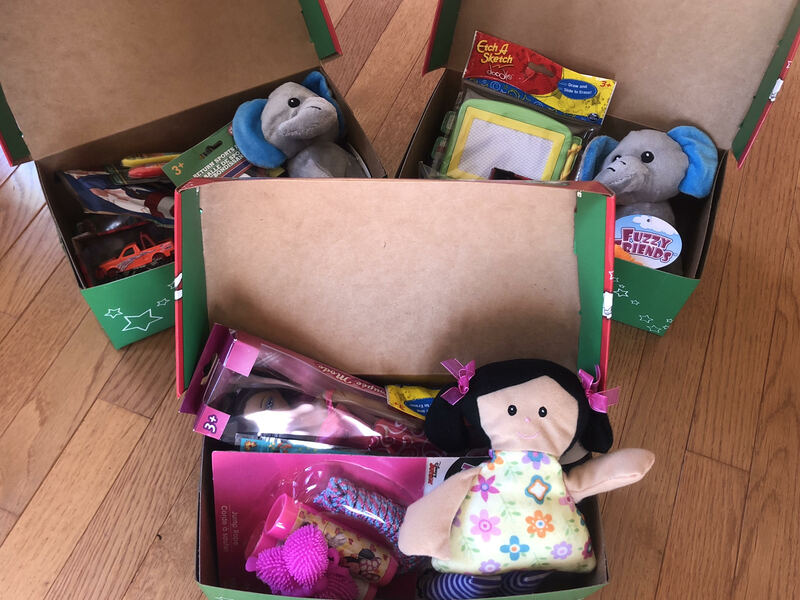 This organization will ship and deliver my box of goodies to a child in need on the other side of the world. How exciting is THAT? 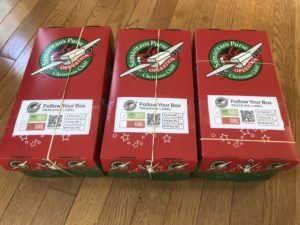 When I printed my box tags, I saw it included a QR code allowing me to track which country receives my box of gifts. Bonus excitement! Three boxes doesn’t seem like much. But when my three boxes join with your two boxes and another box over there, all of a sudden we have enough boxes to fill a large container. Add a few more from some other kind folks, and maybe we have enough to fill the backseat of a car. 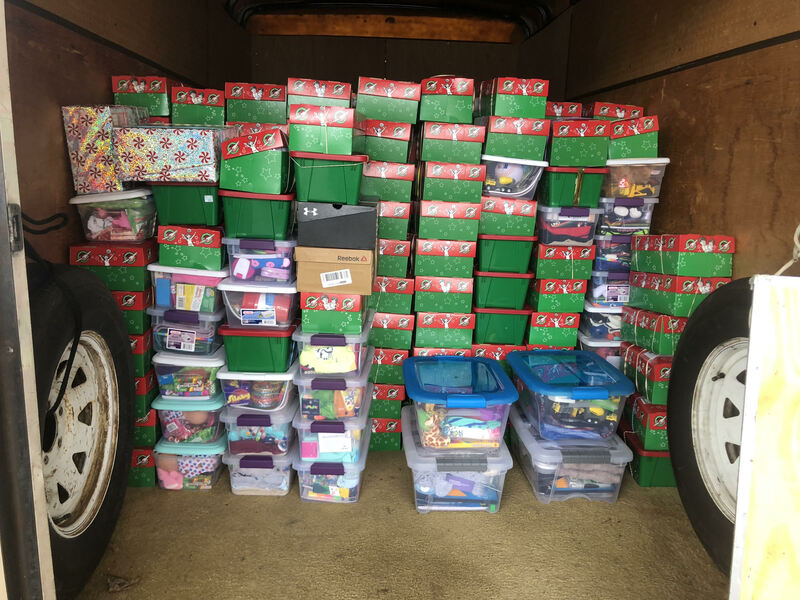 Another box here, another box there… all of a sudden, TOGETHER, we have made a substantial impact and we definitely need a larger vehicle! 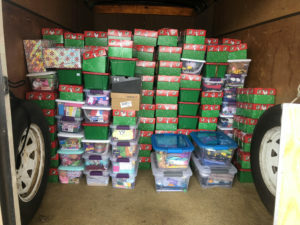 In the blink of an eye, with the kindness of strangers, my meager three boxes magically multiplied into 850 boxes to ship. That’s the power of collaborative kindness. It’s never really about me or you, but WE and US. That’s what makes days like this so amazing! As I entered the Innovation Lab this morning, I caught a glimpse of a sneaky student leaving a kindness message on our laptop cart. Her smile was SO big when she realized that I caught her in the act, so I asked if I could take a photo with her. She readily agreed. It’s not often that someone tells me I’m gorgeous, so I had to capture the joy in the moment! As I finished one of my lessons today, I passed by a teacher who was returning to her classroom. We chatted for a bit, then as we approached her door I saw two post-it notes taped to her door, written by students in our school. 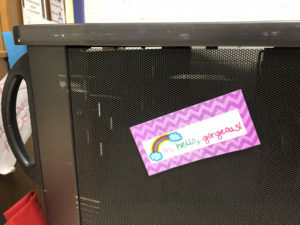 Reading those sweet sentiments and witnessing the jubilation it brought to this teacher… well, you know what I HAD to do! During one of my lessons today, I showed first grade students how to join my Passion for Kindness Seesaw group where they could share kind acts they see or do. 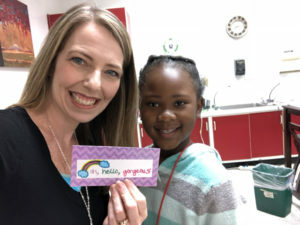 One student shared how she earned her “Super Kid” award by showing kindness in pushing another student on the swings. 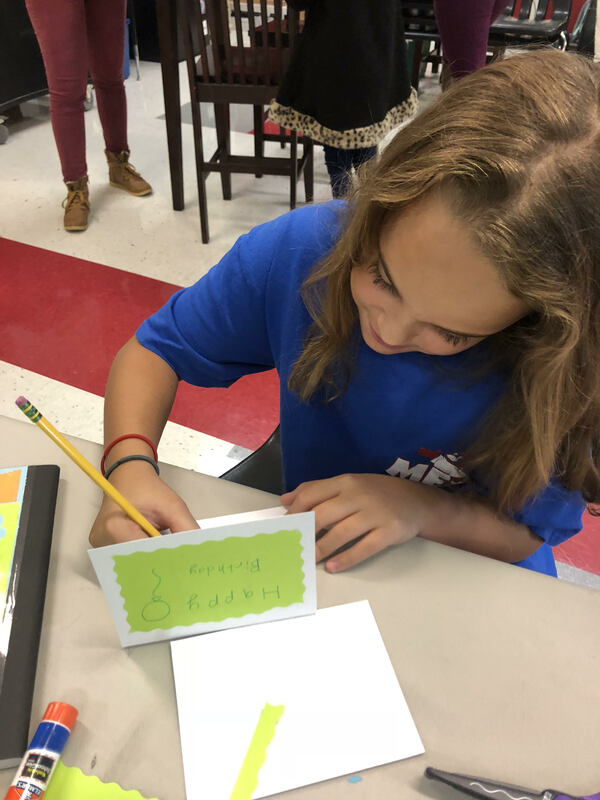 As the day progressed, I met with two of our kindness classes with the mission of creating Kindness cards, inspired by Wendy Hankins and Kind Kids. When we planned these lessons weeks ago, the intent was to create greeting cards to make available for teachers in our Teacher’s Lounge, so they could share kindness with others easily. It was supposed to be a lesson filled with the joy of gratitude and giving. But some things have changed in those few short weeks. 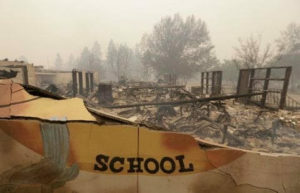 Our evening news is filled with tragic images of uncontrollable fires and burned-down houses. On the east coast where we live, the fear and heartache is distanced as we are far-removed from threat. 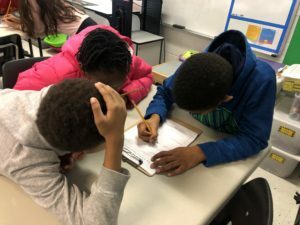 However, it’s our duty as educators to make our lessons real and relevant, so I knew I had to make a connection for our students. 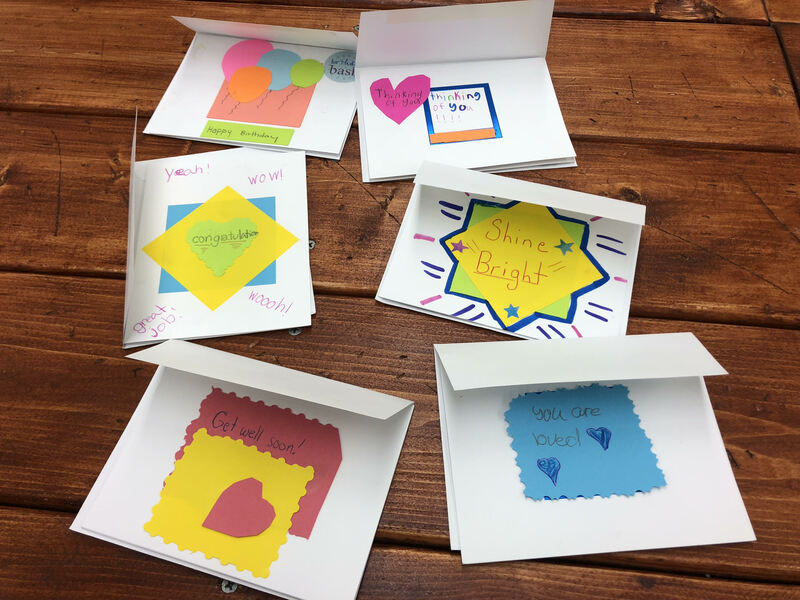 When the lesson began, I shared our original mission of creating Kindness cards for teachers. Then I talked a bit about the recent news of wild fires and the damage they’ve caused. 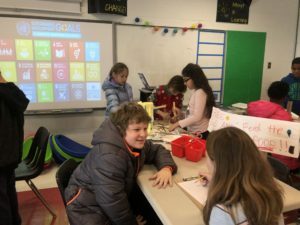 I showed the students a photo of Paradise Elementary, which was spotlighted in the news and from the Kids for Peace organization. The devastation was immediately felt by all the students as the room fell silent with shock and surprise. 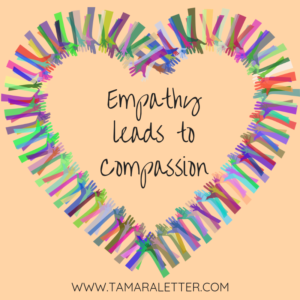 One student said, “I can almost feel the sadness.” This was a perfect lead-in to our cornerstone words of kindness: Empathy and Compassion. 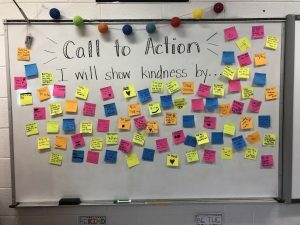 We shared conversations about feelings and how they can become a catalyst to action. Then I gave the students a choice. Using donated cards, we recycled them and made them new again with words of hope, love, kindness and joy. 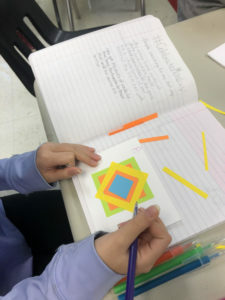 Students decorated with markers, gel pens, colored paper and fancy scissors. They poured their hearts into their work and proudly displayed their final products, sorting them into one stack of cards for California and another stack to be placed in a gift basket for teachers. 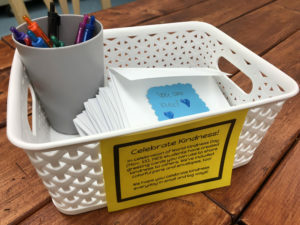 Basket of Kindness cards for teachers to use with new pens and envelopes, too! Whether you celebrate World Kindness Day on November 13, join in the fun for an entire week, or “Make Kindness the Norm” like The Random Acts of Kindness Foundation, it’s always a good time to be kind to others! I hope each and every one of you experienced a ray of kindness shining upon you today. Just thinking about that makes my heart smile! 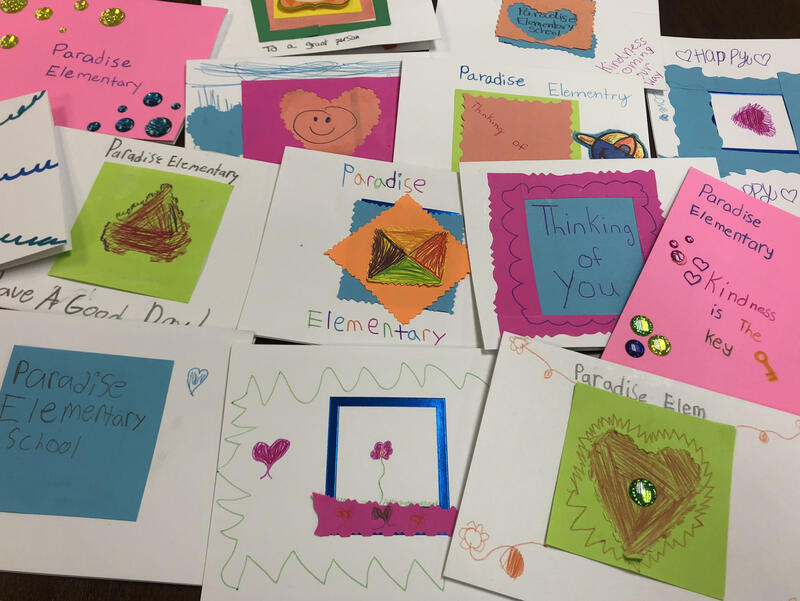 If you or your students would like to create cards for Paradise Elementary, you can mail them directly to the address below, making sure your postmark is no later than December 1, 2018. 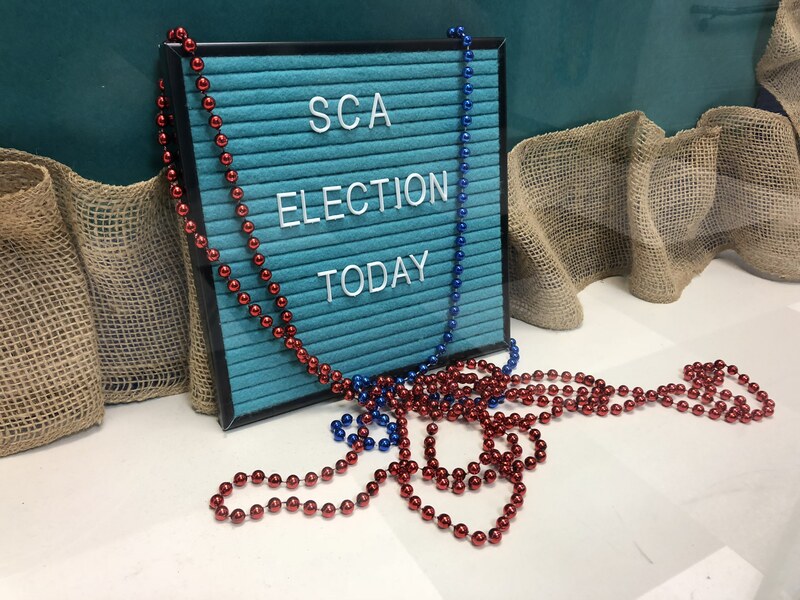 Like many schools around the country, we host an election experience for our students as they vote for their classmates as officers in the Student Council Association (SCA). Just weeks after school begins, students in grades 4 and 5 gather references, complete applications, and record campaign speeches to convince others to cast their vote in their favor. 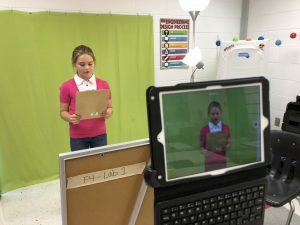 While I am not in charge of SCA, I do provide technological support, recording individual students with a green screen, compiling all videos in an easy-to-view format, creating a digital ballot and information sheet for students (which includes a sample ballot) as well as facilitating the election process for all students in third, fourth, and fifth grade. Each year is a learning curve of enhancements as well as minor hiccups along the way. When election season ends, I always vow to write a blog post, yet fail to make it happen as the never ending to-do list of upcoming projects diverts my attention. 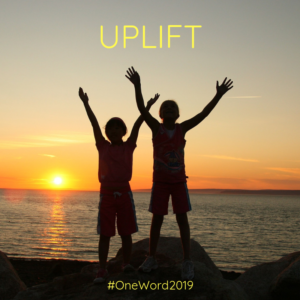 However, my #oneword18 “INSPIRE” reminds me that sharing my experiences is important to help others along the way. It’s in this mindset that I take today, Election Day, to reflect on our SCA Election from this year. 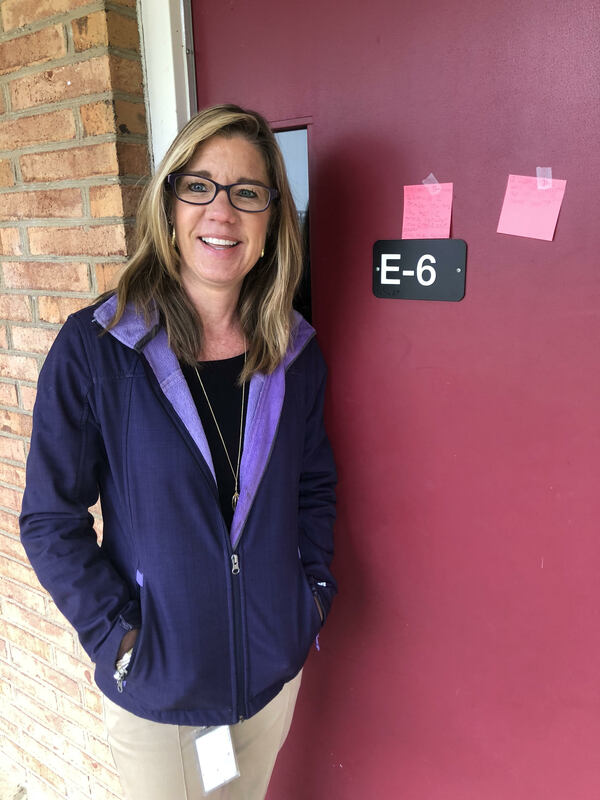 First and foremost, it’s crucial to provide detailed communication to students and parents in this process so everyone knows what is expected and when. In early September, I sat down with our school’s SCA sponsor and worked backwards, identifying the election date then other checkpoint due dates along the way, making sure to include time for me to record students, process videos, and create ballots/information sheets. We also included due dates for application submissions and poster displays. 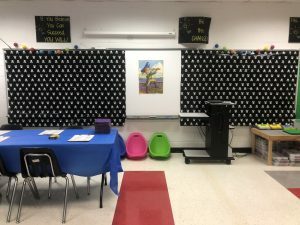 To schedule voting times, I created a digital chart of time slots using Google Sheets, then provided teachers editing access so they could add their name on a time that best fit their needs. Since we have access to several laptop carts in our building, I was able to have two classes scheduled in the same time slot, thus making Election Day more efficient. 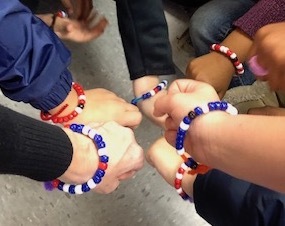 Working directly with students is so empowering as I get to know them as people not simply names on the ballot. They described creative, unique ways to improve our schools if only we would vote for them. One student wanted to focus on kindness as a school theme, complete with identifying kind students who will volunteer to sit with other students during lunch. 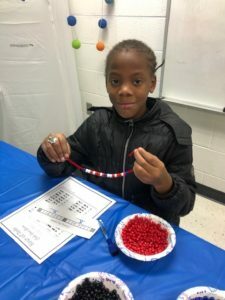 Another student wanted to expand spirit week to provide additional opportunities for students to work together in creating a positive school culture. 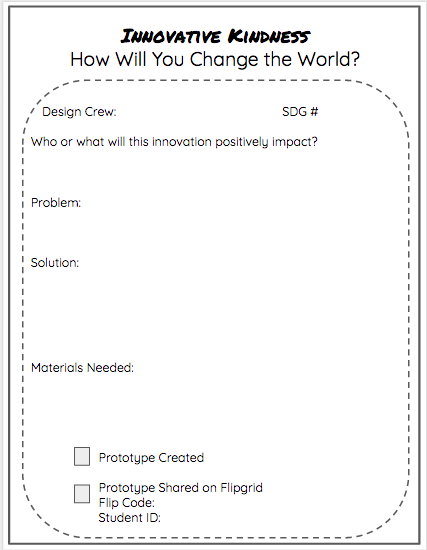 Some students had grand visions of possibilities while others had step-by-step action plans to make change happen. They shared their hopes; they shared their dreams. They poured their passions into their speeches and their enthusiasm showed. A few students were nervous to record their speeches with this being the very first time they had given an “official” speech. I reminded them with a smile that they were just talking to Mrs. Letter and we can always rerecord their speech if they didn’t like it. Some students were perfectionists, recording again and again and again, while others were relieved to be done in one take. I offered them reassurance, positivity, and encouragement for a job well done. 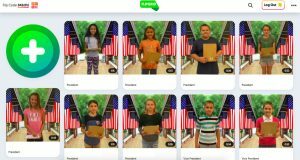 After recording all students in front of a green screen using the DoInk app, we added a patriotic background and uploaded all videos to Flipgrid to share with students using a secure school code to ensure privacy. To keep videos in order of electoral positions, I wrote each student and position on index cards, put them in alphabetical order by categories, then used the cards to post the videos in a backwards order with the last video being first added, thus matching the digital ballot students would use to vote. I created the digital ballot using Google Forms and created a Bit.ly shortcut to make it easier to access on Election Day. 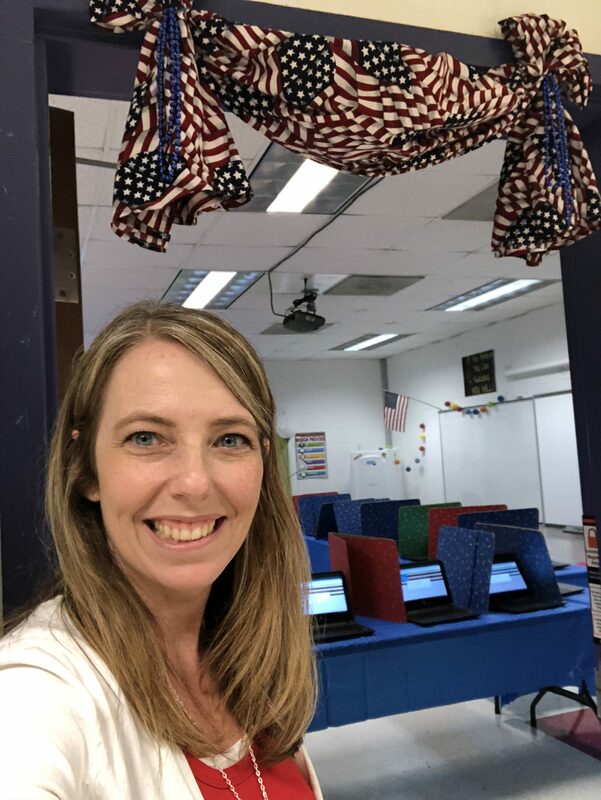 Then I used the form to create screen shots, compiling in a Google Doc as a sample ballot with directions for students and teachers on how to access the campaign speeches on Flipgrid. In Teach Like a Pirate by Dave Burgess, we are reminded of the power of instructional hooks to grab the attention of students as we transform learning into a memorable experience. 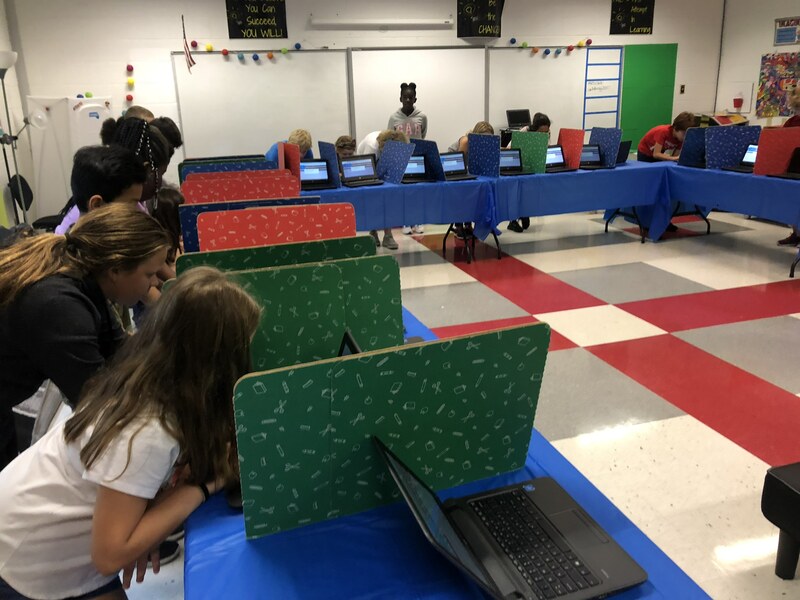 For SCA Election Day, I focused on the Interior Design Hook as I modified our Innovation Lab into a polling station with tables, laptops, and testing shields transformed into individual polling booths. To add additional ambiance, I added an Election Day announcement to our memo board, brightened the doorway with a patriotic fabric banner, and covered tables with blue tablecloths. 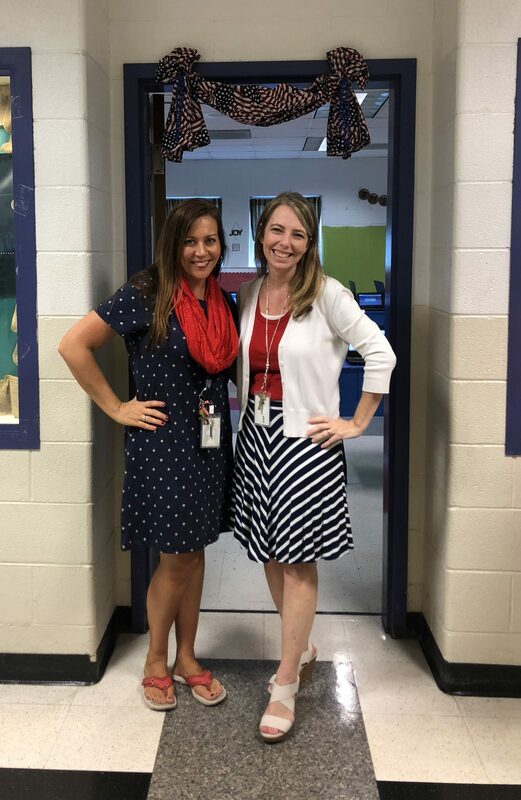 I also remembered to wear red, white, and blue! Before students arrived, I prepared laptops to display the digital ballot (Google Forms) so they could have the full voting experience ready to go when they entered the room. I directed students to their polling booth then shared a quick overview of the voting process, explaining the similarities and differences to how we vote as adults (i.e. voters stand at a polling booth here and there, however we use a paper ballot and scanner as adults instead of a digital Google Form.) Once students understood how to complete their digital ballot, they were allowed to vote for their chosen candidate and submit their vote in the election. There is a powerful energy surrounding SCA Election Day. It’s an experience of choice and voice where every vote counts. 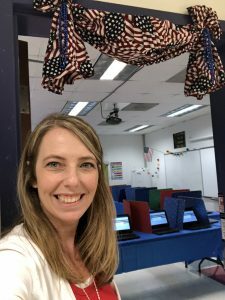 Some teachers use the campaign speeches as a language arts mini-lesson in persuasive speech; others use the event to showcase the democratic process of the United States versus voting rights of other countries. We emphasize citizenship and responsibility, referencing the 5 C’s as we teach. It’s a yearly event that has the power to develop future leaders within our schools. As with any grand undertaking, there are key takeaways following the event that may get overlooked or diminished with time. I want to make sure I am taking time to reflect realistically on our process so that next year can be even better! 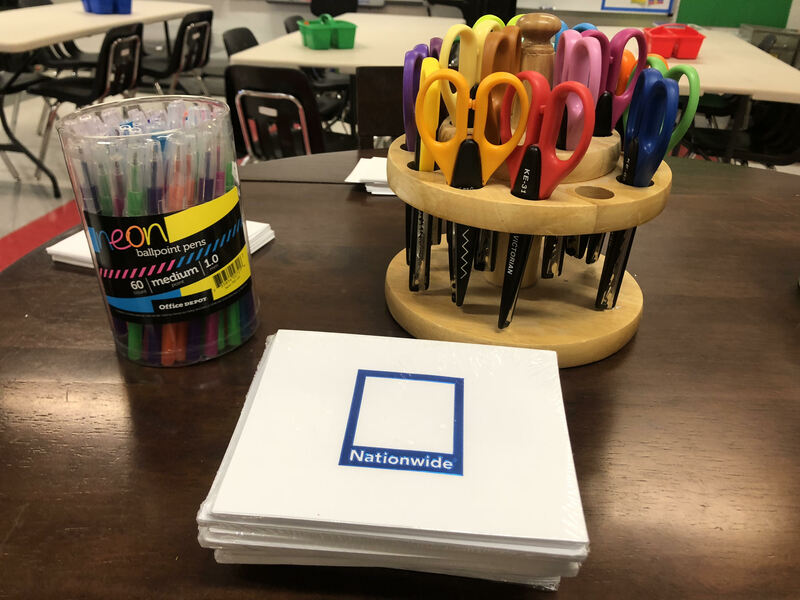 One of our teachers suggested we add a checklist to the student application so teachers know when things are due and can remind students accordingly. I thought this was a great idea! We included a list of due dates for students on their applications, but several applications were turned in without the required speeches written for review. 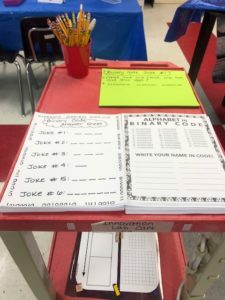 By providing teachers a checklist of due dates, they can post to the board for students to write in their agendas, thus guiding them in being aware of upcoming deadlines. 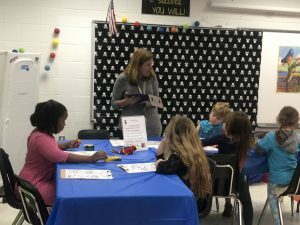 We’ve come a long way from spending half a morning of instruction with the entire student body sitting in an assembly listening to an endless line of candidates, many whose names get muddled in their memory before they even return to class. 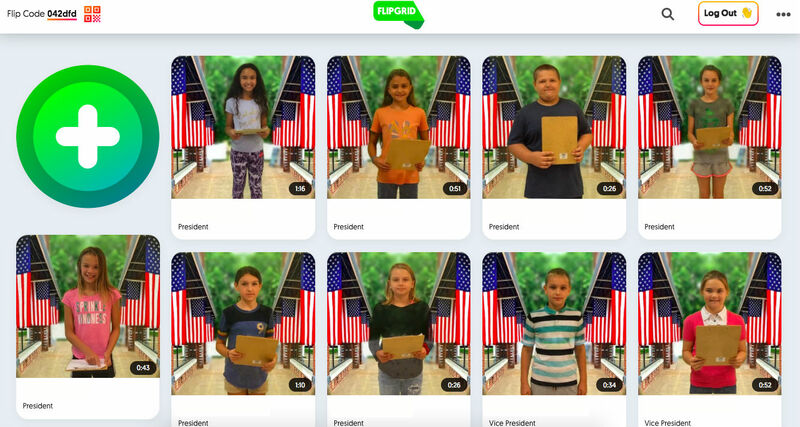 By using videos on Flipgrid, students have the opportunity to watch, listen, and review campaign speeches, providing time for a more informed decision-making process. This year our fifteen campaign speeches were viewed 2,102 times! WOW! 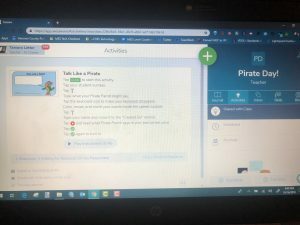 We will definitely use Flipgrid again as our chosen platform for sharing speeches! One huge change this year is my availability of support for this school, which was diminished by 50% as I am only in this building two days a week instead of four. 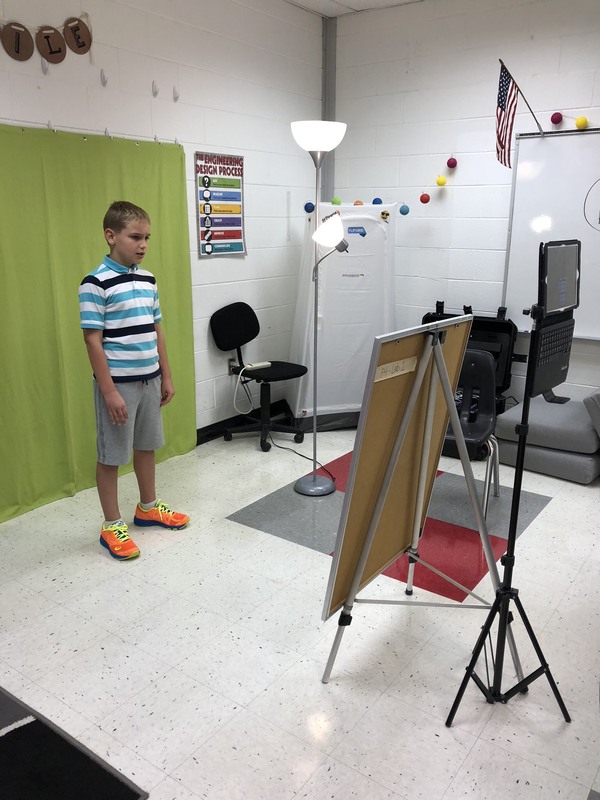 This resulted in a longer turn-around time in making the green screen videos, uploading to Flipgrid, sharing with students and providing time to view before voting. I may need to adjust a few things for next year so the process is not delayed from start to finish. For example, I would love for students to create their own green screen videos, filming each other, but I also want to preserve the privacy of their campaigns so that all campaigns are shared at the same time with no “leaks” of information to opponents. With the reduction of my availability, I didn’t have time to record fifteen students and teach them the nuances of using DoInk and Flipgrid while also meeting the other requirements of my position. Next year, I may save the green screening for another project and simply record students in front of my patriotic fabric instead, saving a little bit of time in video editing. 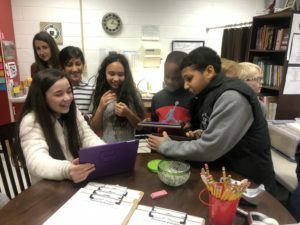 I discovered that several teachers showed student videos whole group to their class on Election Day instead of empowering students to view them on their own during language arts station rotations. 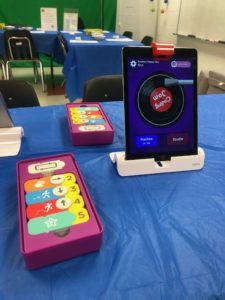 I may need to send additional reminders to teachers and emphasize this option next year so we don’t have additional loss to instructional time. I also need to invest in a lapel mic for our quieter students so their voices are easier to hear as they speak. 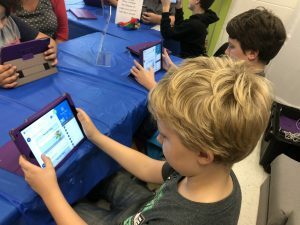 The digital ballot was a huge hit with many students arriving with their choices already marked. By having a recycling bin located near the door, students could dispose of their ballot upon exiting the polling station making voting seamless and efficient. In preparing the polling stations this year I encountered two major issues that almost derailed the morning voting groups. 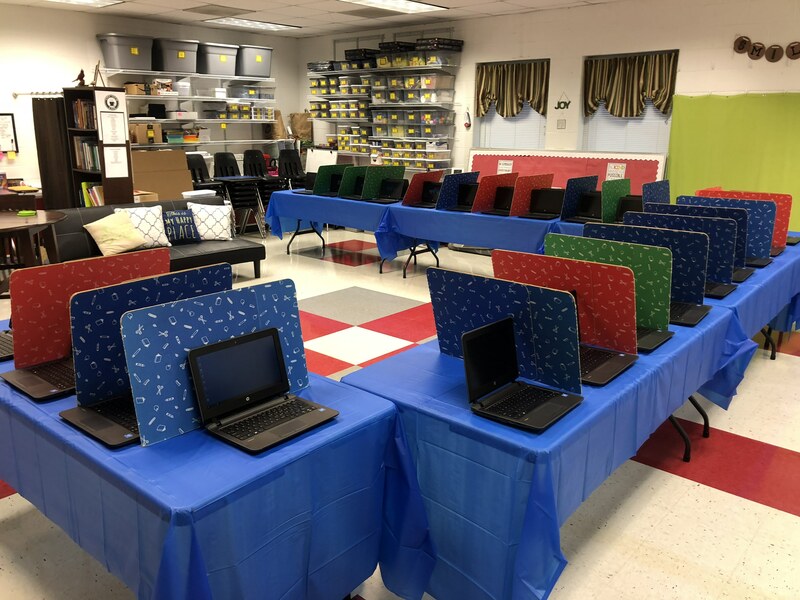 One cart of laptops had not been used this year, resulting in an entire summer of updates being pushed down as soon as I turned them on, making them unavailable for use. Then, I discovered that sleep settings were set to 5 minutes on each laptop resulting in a constant need to log in to access the digital ballot. Oh. My. Goodness. If you’ve ever wanted to witness a tech integrator scrambling from laptop to laptop to get them all up and running, this was your moment! 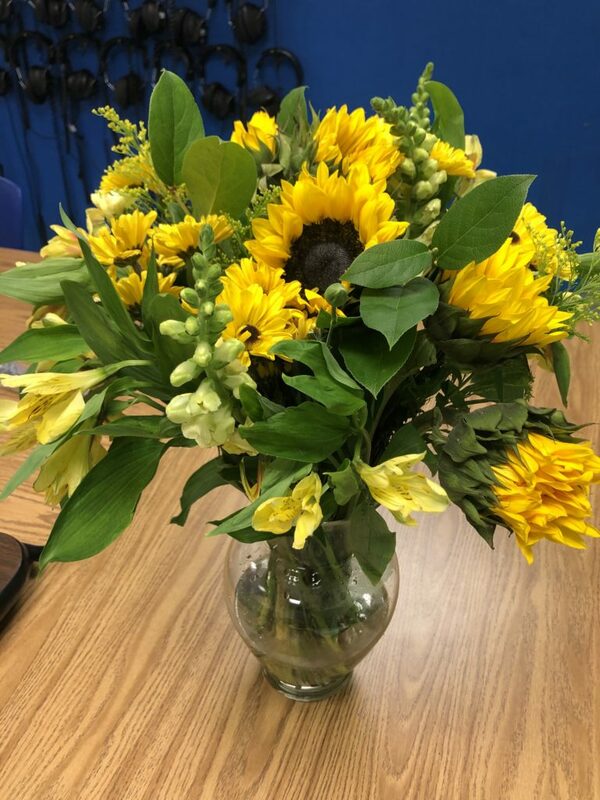 Knowing I had booked several classes in dual time slots, this made for a challenging morning – thank goodness for patient students and teachers who smiled and offered their reassurance as I tried to get everything up and running in a timely manner! All in all it was a positive experience, one of our best years yet. 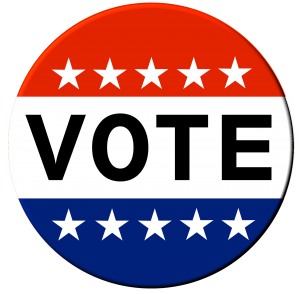 I’m excited to tweak the minor adjustments from this year to make next year’s election even better! I am blessed to live and work in a country where I, and others, have the right to share our voice, make our choice, and hope for a better tomorrow! 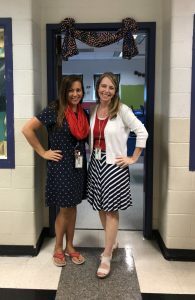 Ms. Biggerstaff, a fifth grade teacher, shares my joy for patriotic outfits on Election Day! Arrrgh there, mateys! 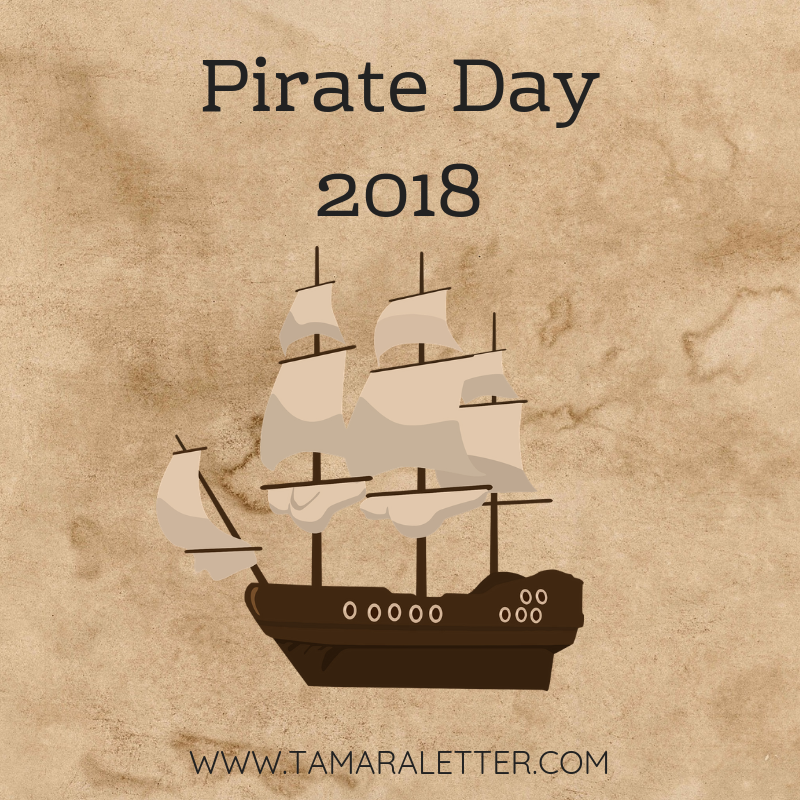 Welcome to Pirate Day 2018! 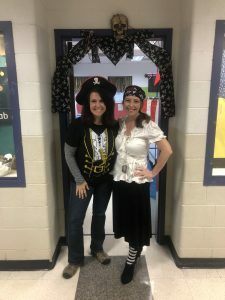 In our second year of promoting the pirate spirit of risk-taking, communication, and collaboration, I invited our gifted-talented teacher, Maureen Ambrose, to help me prepare the crew and transform our Innovation Lab into a sea of grand adventure. What a day we created! We started planning in August, quickly realizing that Talk Like a Pirate Day (Sept. 19) was not an option this year as it was a half-day in our school calendar with a district-wide teacher laptop rollout that afternoon. Before we even raised our flag, we had to choose another date. 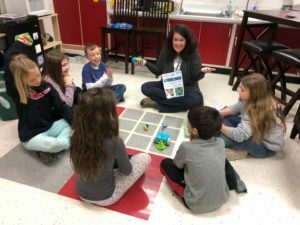 After cross-referencing several calendars and focusing on our “why”, we realized we needed to offer this amazing learning experience on two days instead of one, providing additional opportunities for teachers and students to join in the fun. As luck would have it (or perhaps it was simply the shifting of the wind? 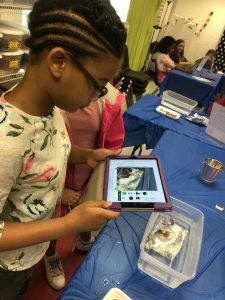 ), we discovered a month later that the date we chose was the same date as our school’s Author Visit, the third grade Ag Day, and school picture day! Egads! Well, friends, let me tell you – IT. WAS. WORTH. IT!! We had an AMAZING two days filled with wide-eyed wonder, active anticipation, and student engagement was at an all-time high! 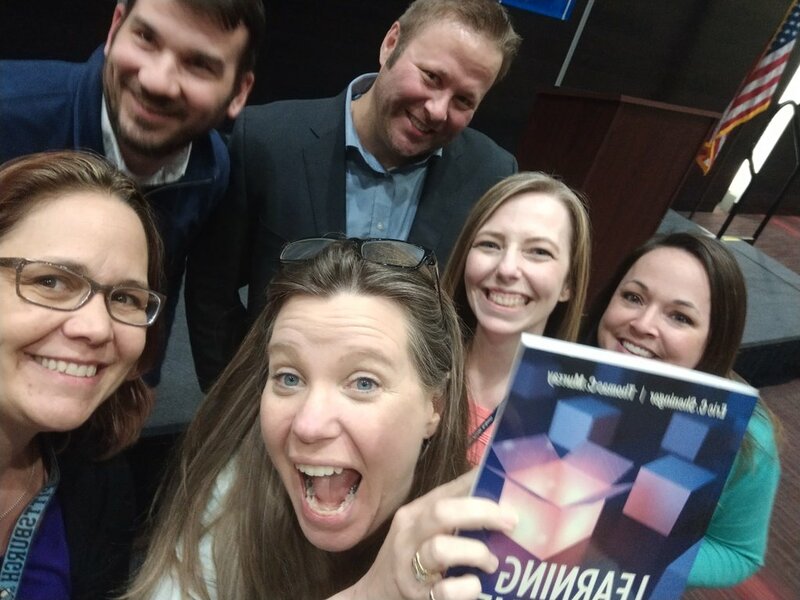 If you are looking for an innovative way to focus on the 5 Cs while integrating technology and instructional content, keep reading to open this treasure box of insight and inspiration! All great pirates know that half the joy in adventure is dreaming big. 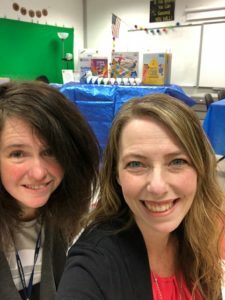 Maureen and I started our planning process by brainstorming dozens of activities we wanted to do, then whittled them down to align with our state standards, district goals, and grade level expectations. 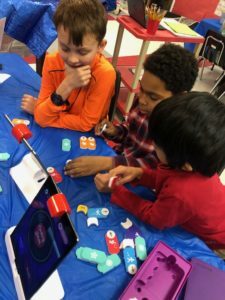 We knew we wanted to promote the concept of station rotations and we also wanted classroom teachers to be an integral part of the learning process (they needed to steer the ship, too!) 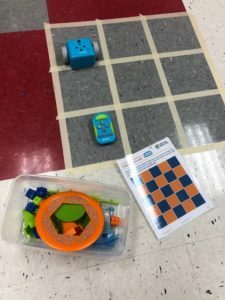 In that mindset, we decided to plan a 40 minute adventure with three stations, students rotating to a new landing every ten minutes, leaving time for a five minute introduction and a five minute reflection before the next ship sailed the seas. 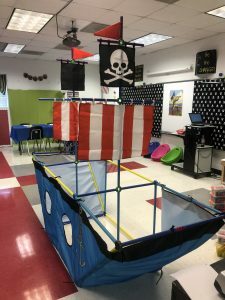 Since the needs of kindergarteners are much different than the needs of fifth graders, we knew we would have to provide a variety of activities, but our transition time for setting up/tearing down stations would be limited, so that led us to create two pirate days – one for K-2 students and another for 3-5 students. We created a Google Sheets sign-up and changed the sharing settings so that anyone with the link could edit the sheet. 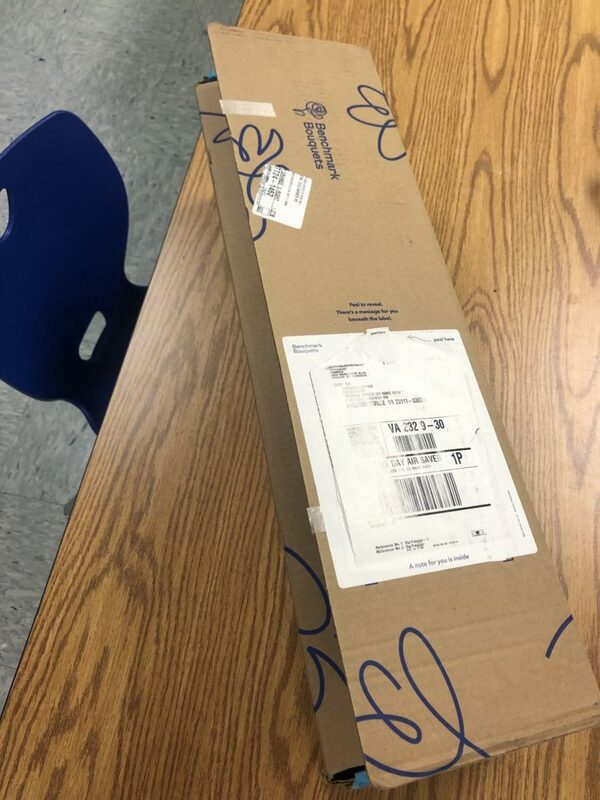 We sent our email out to teachers inviting them to sign up for a designated time and were blown away when our sheet was nearly filled the first day! WOW! Reflecting on Pirate Day 2017, we wanted to offer new pirate-themed activities for our students while continuing the “best of the best” from the year before. Since designing an unsinkable pirate ship was a huge hit in our Makerspace area last year, we kept that activity going, but with a few enhancements based on lessons learned. WAIT – did I just say water? 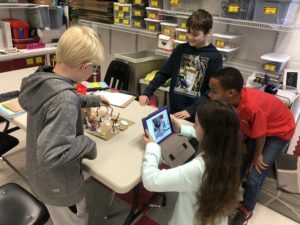 In an Innovation lab with laptops and iPads and robots nearby? Yep! You read that correctly! See, we can do amazing things if we train our crew before we board the boat. It’s all part of the preparation! Buy LOTS of absorbant paper towels. Those thin, brown sheets of sandpaper masquerading as paper towels in your dispensers by the sink will do nothing more but crinkle and curl, making more of a mess than you already had. It’s worth the expense of purchasing the good stuff, trust me! 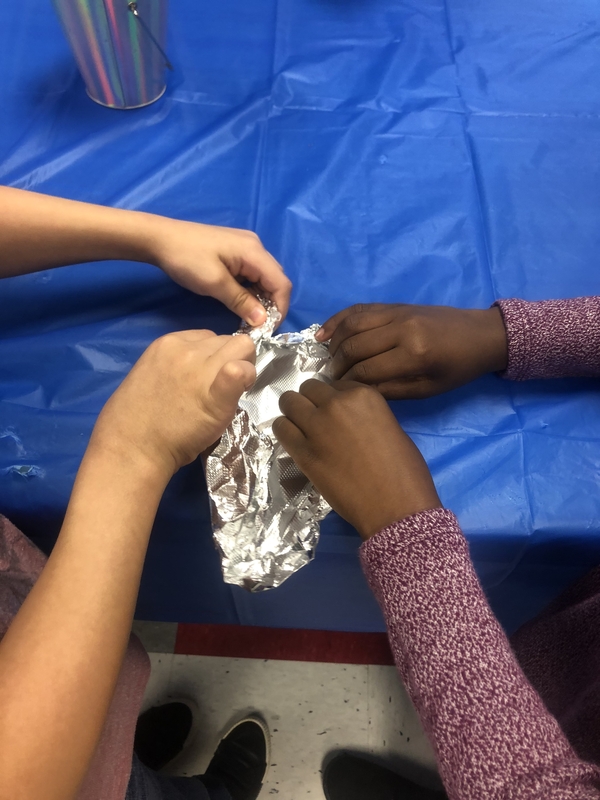 We used Viva Choose-a-Sheet paper towels and each small group was responsible for cleaning up their own station, even the kindergarteners! Cover your tables with cheap, plastic tablecloths. It cost us a whopping $2.00 to provide an easy-to-wipe surface for any water spills, then when Pirate Day was done we rolled up the table cloths and threw them away for easy clean up. Buy pop-up foil sheets. Did you know you can purchase 500 sheets of foil for less than two venti drinks at Starbucks? It’s true and worth every single penny. 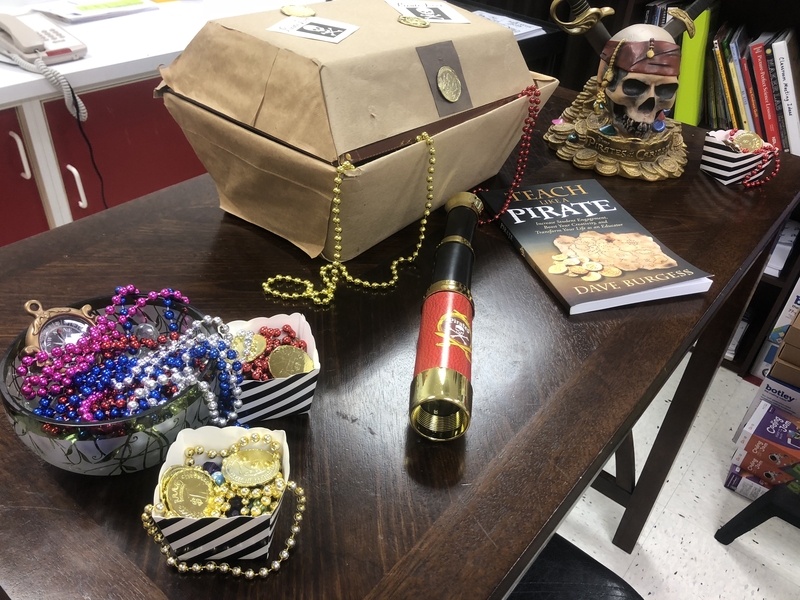 Productive pirates know that saving time reaps great rewards so buy the box and rock on with your day! 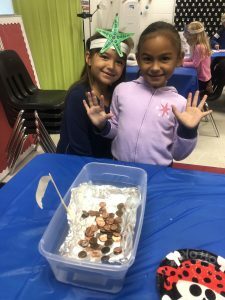 Provide pennies, but skip the cute paper plates. I bought four rolls of pennies (for another $2.00) and divided them into four cute, pirate plates I found in the party section of Target. Great idea on the pennies – complete fail on the plates. 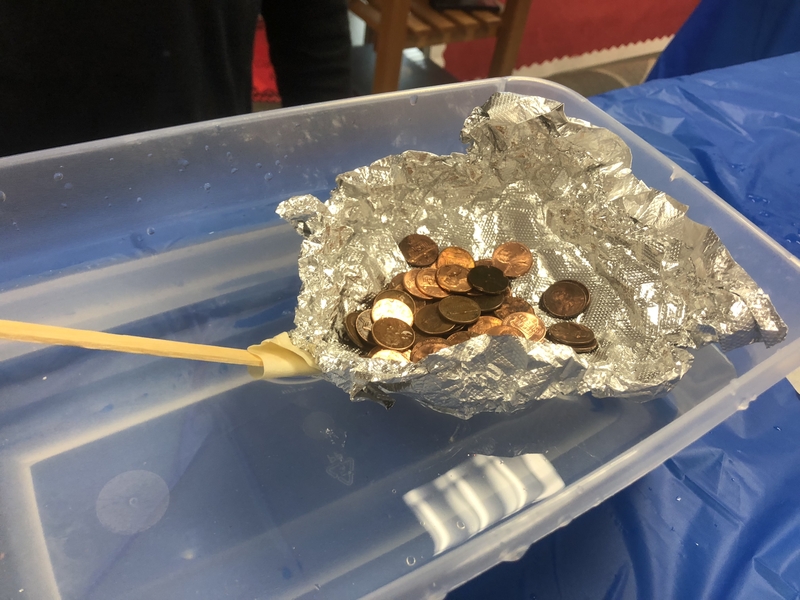 By the third class, this pirate knew she had to find another way to store her treasure as the paper plates were completely destroyed from the water on the coins. Using styrofoam plates as a last-minute replacement saved my sanity and made it easy to drain extra water from treasure fished out from the bottom of the sea. If you are reading this now, make an even better choice and use a small plastic plate or shallow bowl instead. Make a Flipgrid grid and have your devices ready to capture the fun! 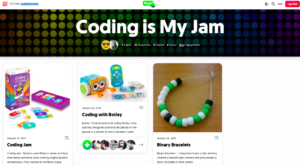 Since Flipgrid changed their grid set-up, we now use Student Lists with our grids. 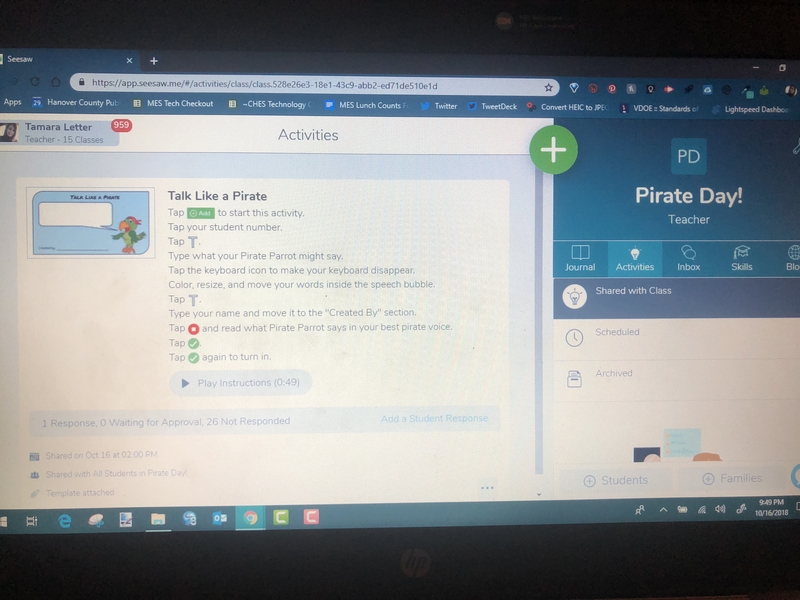 Prior to Pirate Day, I created a grid that Maureen and I could use to create topics for the stations we wanted to capture. Take a peek here to see a sample of our ships and which designs were unsinkable! 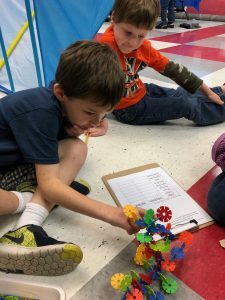 (K-2) Pirate Ship Creation – Using Brain Flakes, students create a pirate ship using the colorful, interlocking discs. 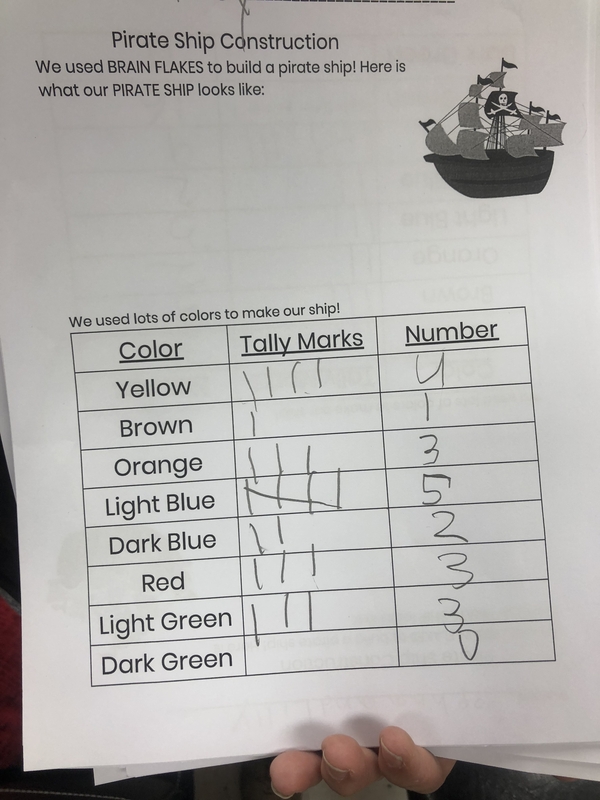 Then, pirates count the various colors used recording tally marks and/or numbers on their recording sheet. 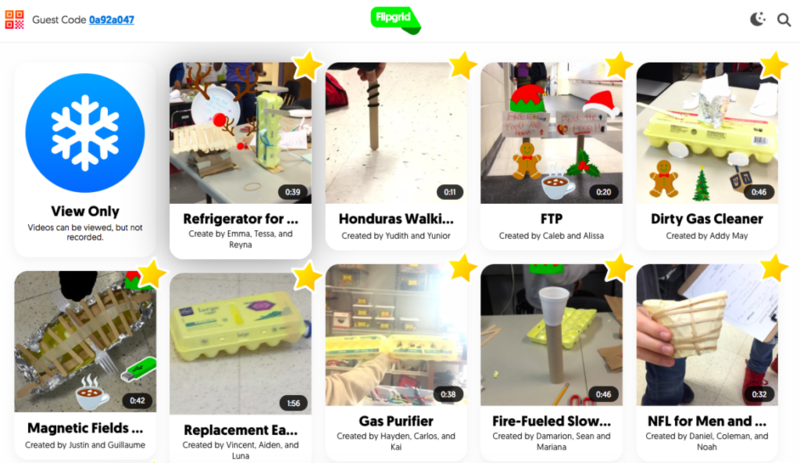 As an extra bonus, students can share their creations on a Flipgrid topic. 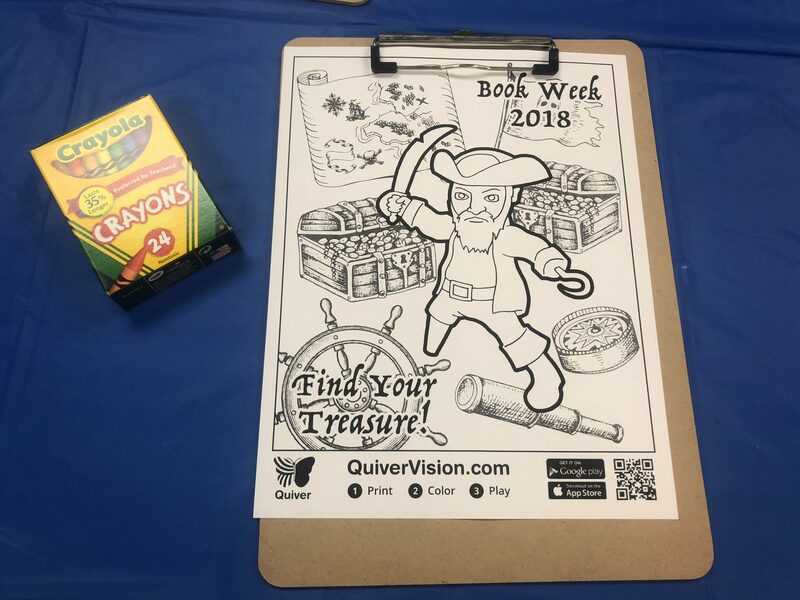 (K-2) Create a Pirate – Using free coloring sheets from Quiver Vision, we printed the pirate sheet from Book Week and allowed students to color their pirate. 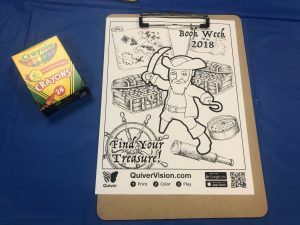 After coloring, students used the Quiver app on iPads to make their pirate come to life, talking to them in a unique augmented reality (AR) experience. 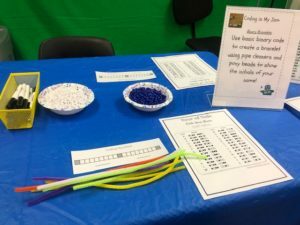 We shared with teachers how they can access more coloring sheets to use as a fun center rotation in their classroom. 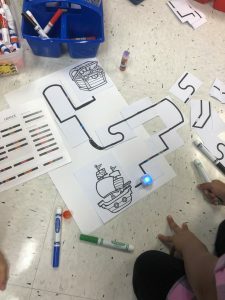 (3-5) Pirates of OZ (Ozobots) – Using Ozobot robots and pre-printed coding tracks, students designed their own path from ship to treasure, using color codes to guide their robot along the way. 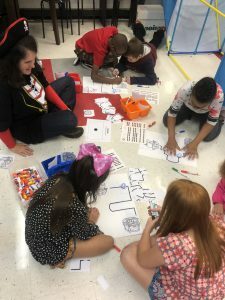 Students were encouraged to extend the tracks or draw new shapes using a black marker. Students were able to watch their Ozobot travel and redesign courses if needed should an Ozobot walk the plank right off the page. (3-5) Talk Like a Pirate – Using a Seesaw activity template, students joined a Pirate Seesaw class, typed things a pirate might say using the suggestion sheets we provided for inspiration, then recorded themselves speaking their best pirate-ese! 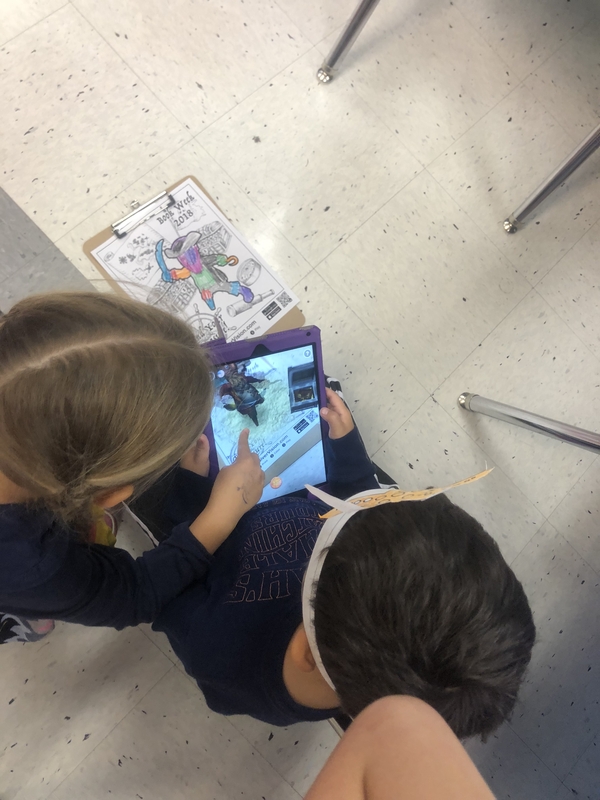 Best of all, they shared their talks on Seesaw so other students could listen and learn, too! 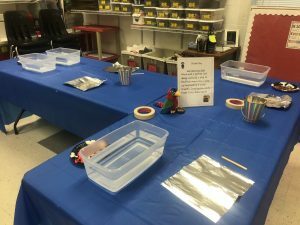 We wanted to create the best pirate learning experience we could with total immersion. 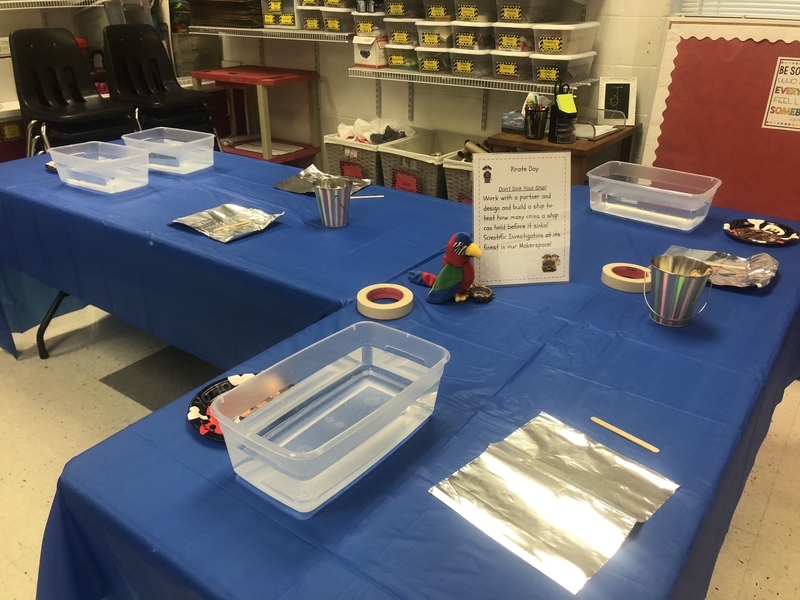 In addition to creating space for rotations with the flexible seating in our Innovation Lab, we added blue tablecloths to simulate water, decorated from one end of the room to the other and donned our favorite pirate attire, greeting all pirate crew members at the entrance. 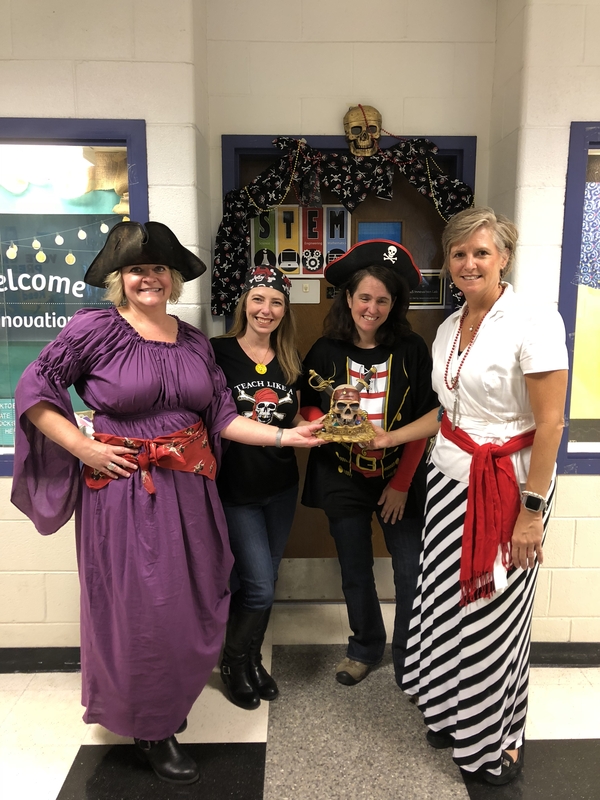 As music from the Pirates of the Caribbean soundtrack blared from the speakers, we guided our pirates past the pirate ship into the galley for the introduction to our day. 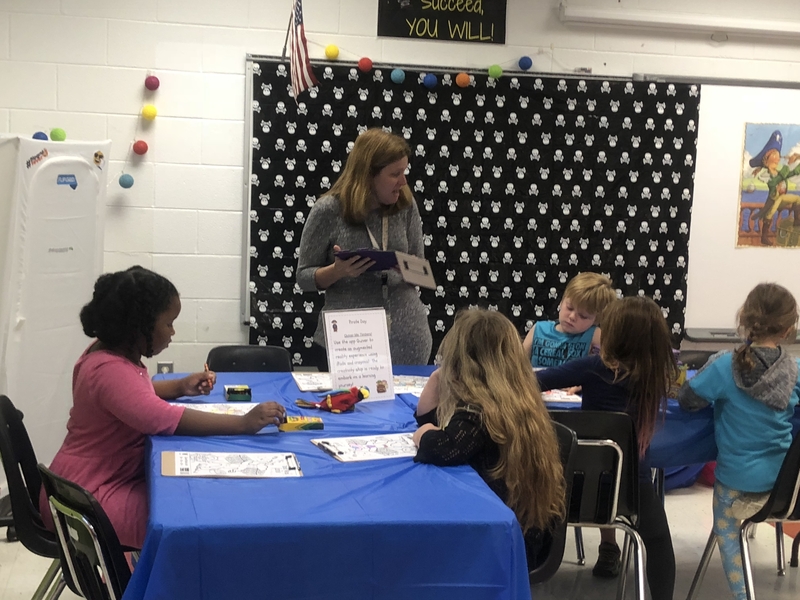 As I spoke with students, Maureen pulled the classroom teacher to the side and gave her a quick run through of what she would do at her station. From there it was all-hands-on-deck as we began our activities, rotating every 10 minutes, thanks to Maureen’s reliable phone timer. After the last rotation, we gathered the energized travelers back to the galley for a reflection of our learning experiences. Resilience. Grit. Determination. Perseverance. 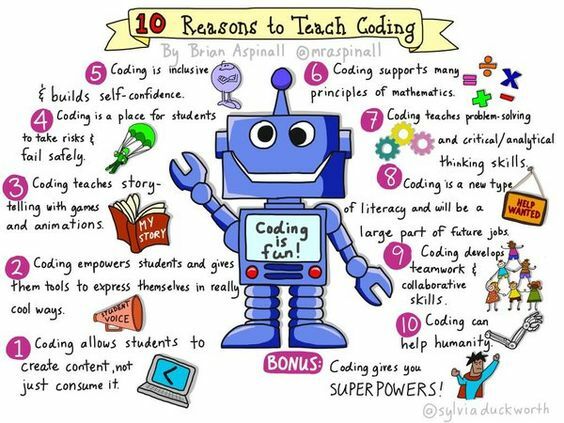 We saw these characteristics in our students as they worked through the various challenges they encountered in their rotations. They discovered that masking tape loses its stickiness when it gets wet. 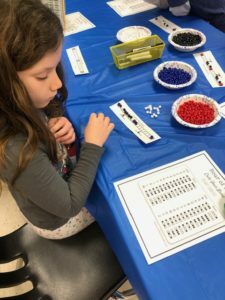 They realized the importance of making colored dots the same width and length for coding. They shared their unique insights on what it meant to be a pirate learner, a risk-taker, a success. We didn’t have a single discipline issue from any class on any day. 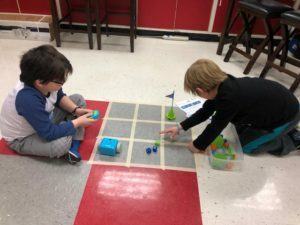 Our students were completely engaged in the tasks at hand and most didn’t want their time to end. 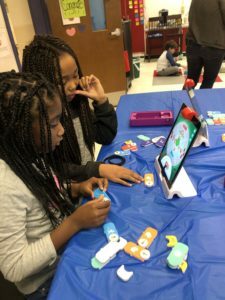 We made learning empowering, relevant, and fun. In fact, our Pirate Day was so successful, we are going to repeat it again in the spring for the classes who couldn’t attend in the fall! We hope our grand adventures on the high seas has inspired you to step out of your comfort zone and try something new. 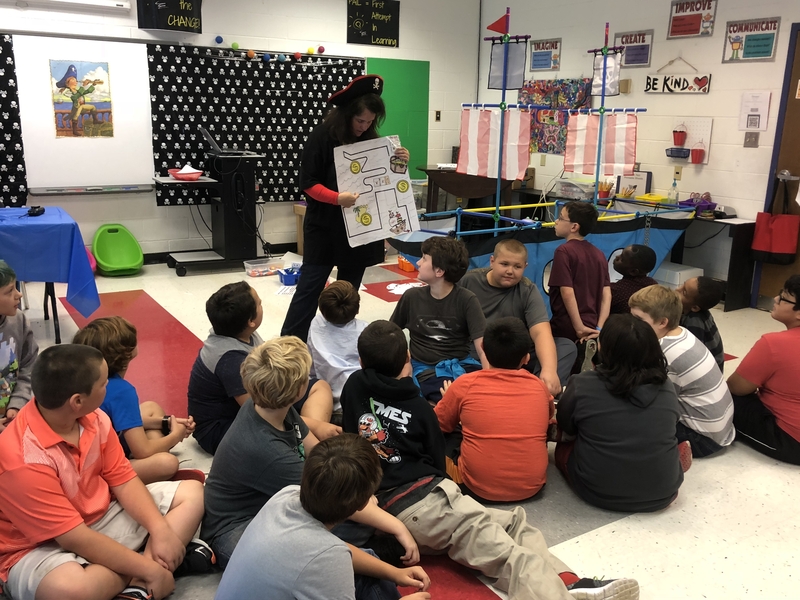 We look forward to sharing more themed days as we continue throughout the year! Later that evening, as my teammates and I traveled through the city, I pondered this concept of “What if” as I looked at those around me. What if I complimented the person making my meal? 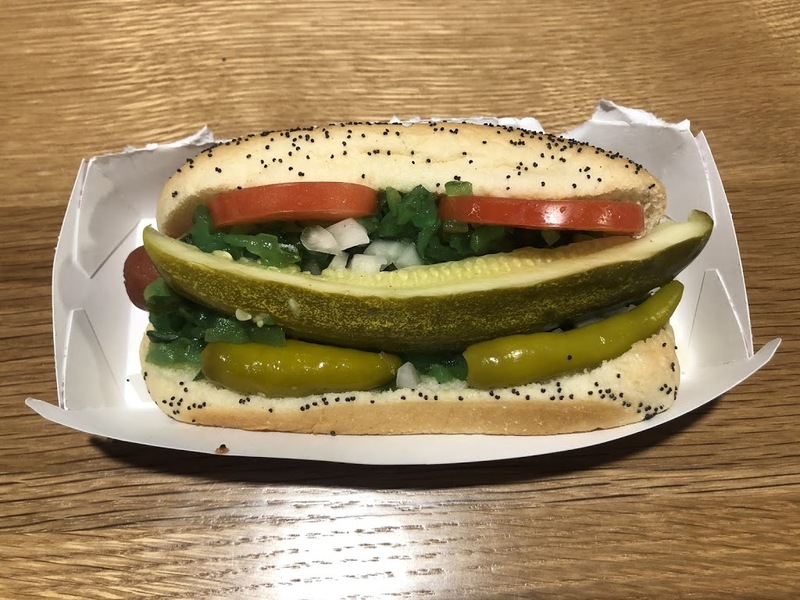 As a tourist in the city, I knew I would have to order a Chicago style hot dog before I left. 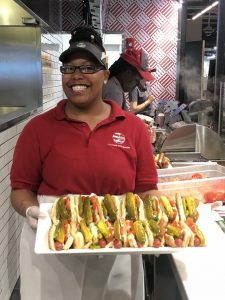 Even thought I’m not a huge fan of hot dogs, I was intrigued by the combination of beef, onions, pickles, tomatoes, peppers, and mustard. While visiting Navy Pier, I stood in line at one of the many food stands to order this local fare. As I waited for the cashier to give me change, I was struck by the precision of the cook who layered each ingredient over my hot dog. When my number was called and my meal provided, I was awestruck at the overlay of colors and textures between the edges of the poppy-seed bun. I asked if I could take her picture, to which she agreed, and then asked if I could text her the image. I wanted her to see just how beautiful her work was from the view of a stranger. This is the photo I captured in the moment. What if I complimented the person making my meal? Perhaps I might make someone else smile at the beauty of their creation. What if I spoke to a stranger on the bus? My teammates and I ventured to Navy Pier by bus, enjoying the sights and sounds of the city. When it was time to head back, the weather had changed from warm, sunny skies to a drizzly, bleak rain. It made for a long evening of travel as we switched buses and waited at bus stops, but we huddled together and passed the time chatting and checking our Twitter feeds. As we boarded our last bus for the evening, we sat near a young man who smiled, but was non-committed for conversation. My teammates and I were in a jovial mood despite the rain (we really are quite a happy bunch together!) and continued to reflect on our day with shared stories that made us laugh all over again. At some point the young man shook his head and laughed at something we said, so we included him in our conversation. We asked him questions about the city, then giggled when he cracked a few sly jokes of his own. The banter between my team and him was lighthearted and fun, and it made for a great way to pass the time as the bus meandered from one block to the next. We teased him about his tiger pants which started another round of laughter as one quip led to another, this stranger now a welcomed member of our traveling crew. He caught my eye and asked if I liked wall art. I wasn’t quite sure what he meant by the question, but I smiled and said, “Of course! I love all kinds of art! 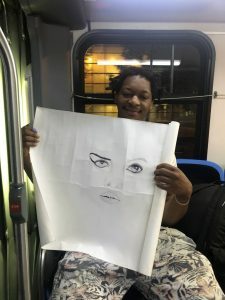 Street art, wall art, children’s art…” As I responded, he unwrapped the grey shirt in his lap to reveal a rolled-up paper cylinder held together by a rubber band. As he removed the binds and unrolled the paper, I literally gasped at what I saw. It was a beautifully drawn face with amazing detail, right down to the perfectly drawn eyelashes. I leaned forward and gasped again as I saw the silhouette of a face in the small pupil of the left eye. It reminded me of the cover of Mandy Froehlich’s new book, The Fire Within, with a flame embedded deep inside. “This is incredible!” I exclaimed as I peered again at his masterpiece. Meet Julius. He’s 23 years old, lives in Chicago, and masterfully kept his artwork dry and safe from the rain using a plain, cotton shirt. He also received the nickname “Juice the Tiger Tamer” from our team who practically adopted him as one of our own. I encouraged him to take photos of his work and showcase them on social media, then gave him my business card to stay in touch. This young man has potential for greatness and I told him just that. The smile on his face as we went our separate ways was priceless. What if I spoke to a stranger on the bus? Perhaps I could inspire them to see the talent and greatness they already possess inside. What if I gave away something of value? When our conference time was complete, my teammates and I took the train back to the airport to head home. 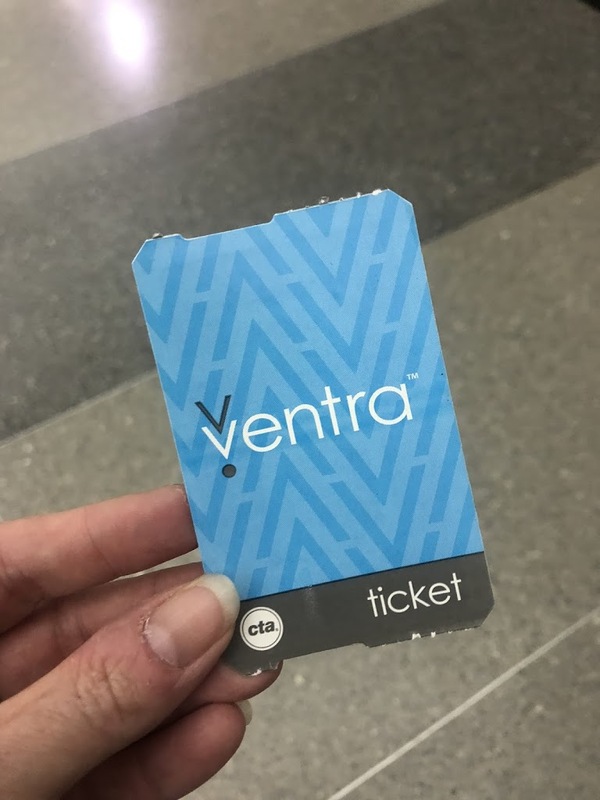 We each had purchased a 7 Day commuter transit card, but had only used four days. As we reached our final destination and exited the train terminal, all nine of us gave our transit cards to strangers waiting in line to purchase their own. Oh, how I wish I could have captured the surprise and joy on the faces of those who received our transit cards. They were so excited! We saw expressions of awe and appreciation and one teammate even received a spontaneous hug for her kindness. The entire exchange lasted less than one minute, but left us all with happy hearts. What if I gave away something of value? Perhaps it might lighten the load of someone else who needs to be reminded that there is good in this world. What if I helped someone at the airport? 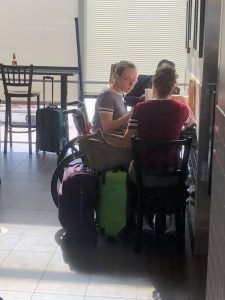 Later that afternoon, as I walked down the airport terminal to stretch my legs, I saw a woman pushing a wheelchair with a younger woman inside. I assumed they were mother and daughter and started to look away when I noticed the woman in the wheelchair trying to recenter a rolling suitcase that had unexpectedly turned on its side. There was a slight protest at first, but I reassured her that I really did want to help and it wasn’t an inconvenience. I noticed the mom had her luggage cart wrapped around her arm so she could pull it while also holding the handle of the wheelchair. “May I have that suitcase, too? I don’t mind.” The mom looked at me, first in shock, then appreciation, as she untangled herself from the constraints of the plastic and metal. “We’re looking for a place to eat,” she replied and I offered to walk with them until they found a restaurant to dine. The airport was crowded without many options for seating, so I volunteered to scout out the chosen place for a wheelchair accessible table. I saw a man about to sit at a long, low table, and asked if he was using the two additional chairs at his side. He hesitated, then said he was saving them for two friends. I explained that I was trying to find seating for a mom and daughter in a wheelchair and this table was a perfect height. Could they possibly sit at the end? He agreed and as I turned to walk away and notify the mom, the most amazing thing happened. Another person sitting near had overheard our conversation and offered to scoot down so the man and his two friends could eat there, thus making the entire table available for the mom and daughter. 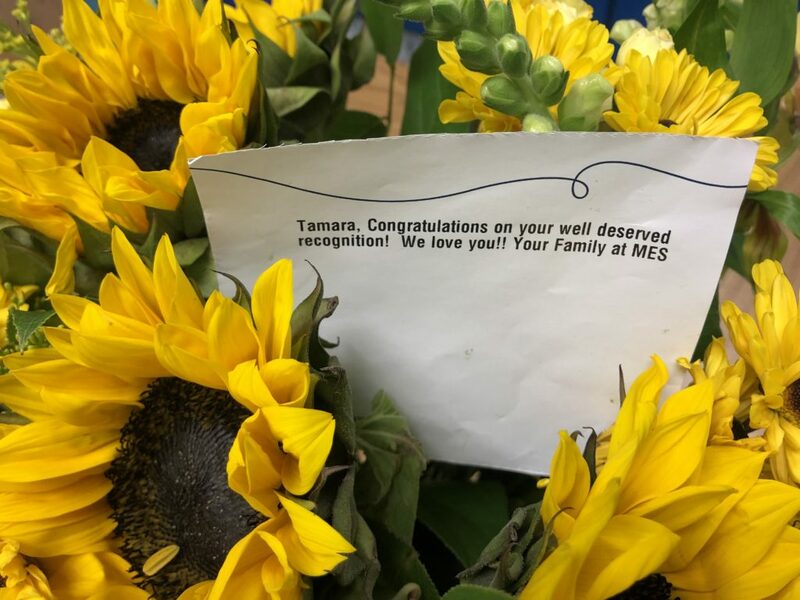 It was an incredible gesture of kindness! 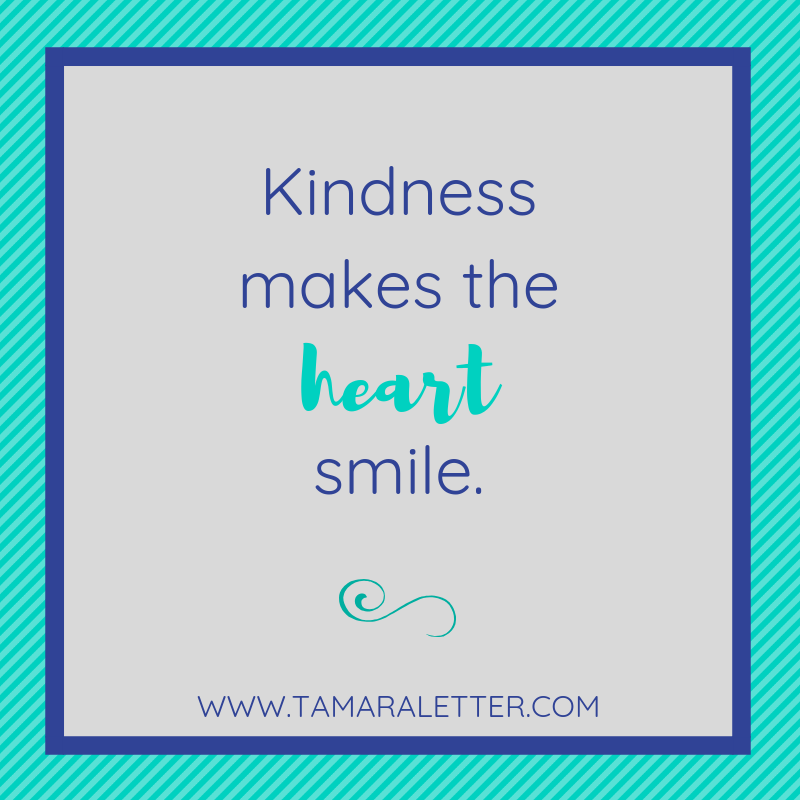 (I talk about this “kindness trifecta” in the book I’m writing, but it was such a joy to see it happen in person!) 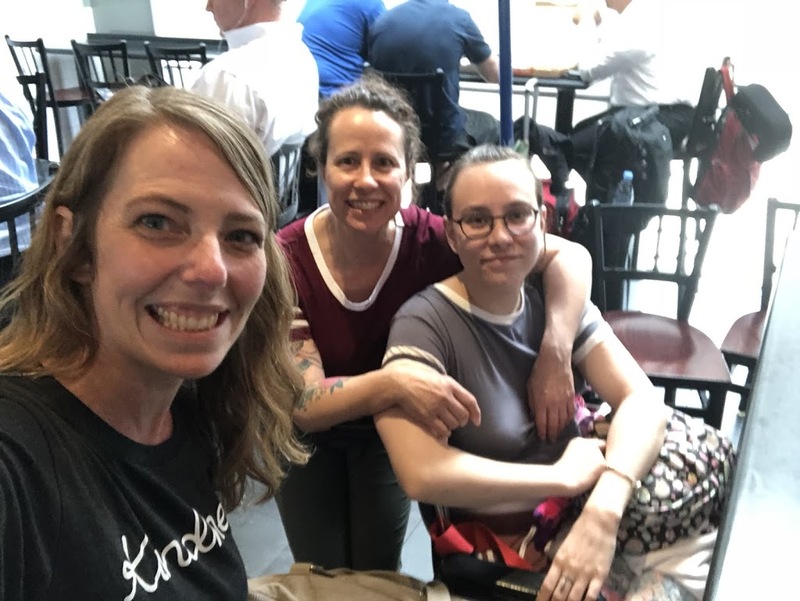 The mom wheeled her daughter to the table, then commented on the shirt I was wearing, a gift donated by The Random Acts of Kindness Foundation. I nearly teared up at her words. 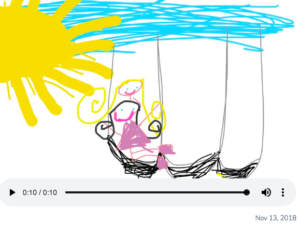 She went on to describe why her daughter was in a wheelchair, explaining she had just received surgery to relieve the excruciating pain she had struggled with since the age of twelve. Her daughter was 20 years old. The only cure for her pain was a complete hysterectomy. 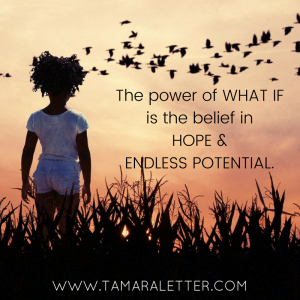 The weight of her words and the impact of “What if” could be seen on both their faces. It was a life-changing surgery complete with the range of emotions one might expect from a young woman being told she will never have children of her own in a traditional way. The daughter nodded her head in agreement then shared her plan to eventually become a mom through a surrogate. The smile on her face when she talked of being a mom reflected my own heart as a mom of three kids (one of whom is almost her age.) 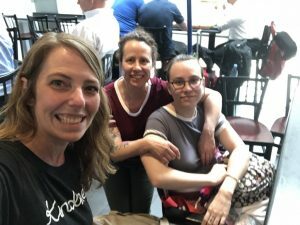 In that exact moment, the world melted away and we were just three women, connected by kindness, sharing the wonders of motherhood. What if I helped someone at the airport? Perhaps it would remind me of all the things I have to be grateful for in my own life. 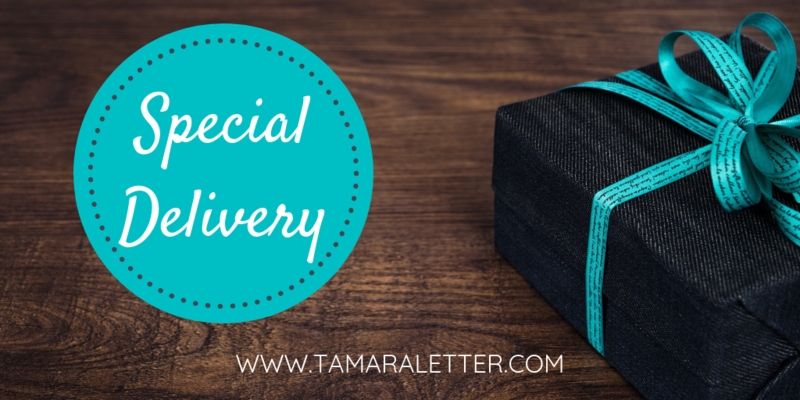 What if the world could see the ripple effect of their kindness? What if others could know the impact of a smile, a kind word, a helping hand? What if each person reading this story did one kind thing for someone else? What if the world could be a gentler, kinder place to live? 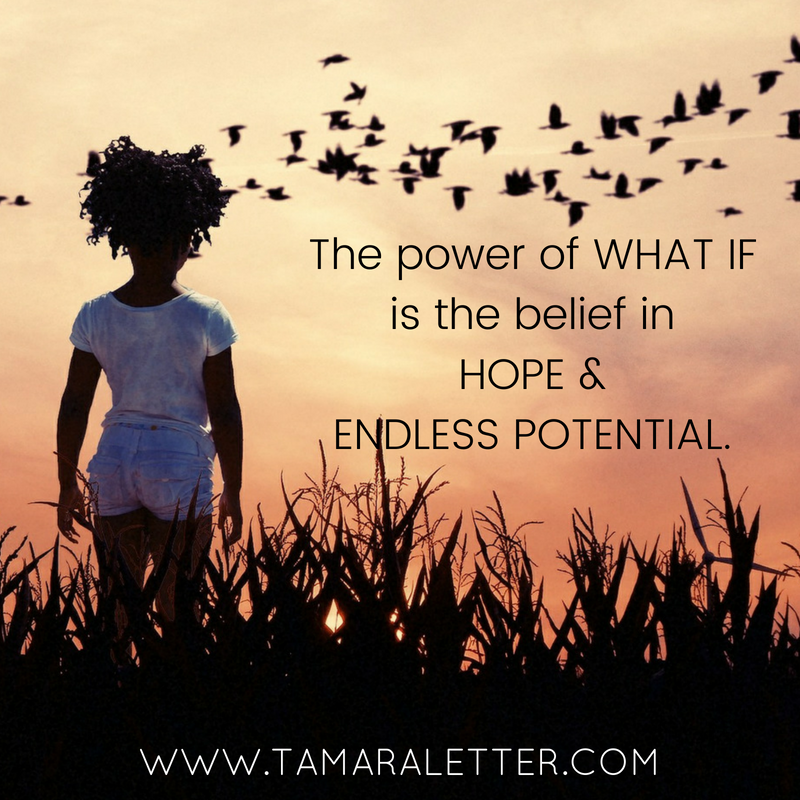 I believe in the power of hope and endless potential. I also believe in the power of WE. 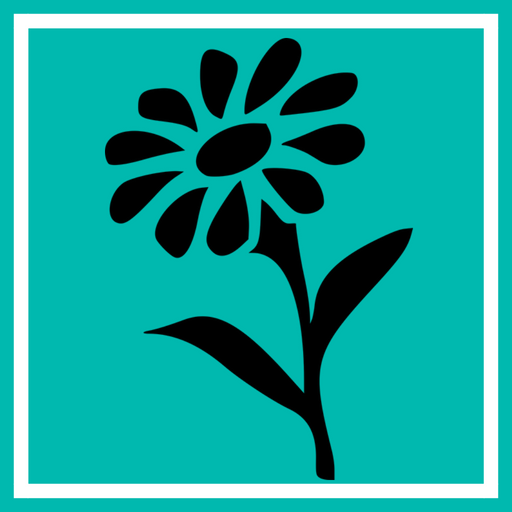 We have the power to plant that seed of kindness in someone else to grow and flourish. We have the power to inspire others to create a course of positivity and hope. We have the power to make a difference in the lives of others and change the world for good. All it takes is one simple choice, one simple action. Last week I had the honor of leading the closing keynote for the Clarke Innovation Conference. As several of you know, I’ve had “Keynote Presenter” on my professional bucket list for quite some time, ever since I got a taste of keynoting at a local conference several years ago. The topic of my keynote was embracing change, a subject that is near and dear to my heart. There is so much fear and trepidation that accompanies change, both of which I’ve had to overcome this year. 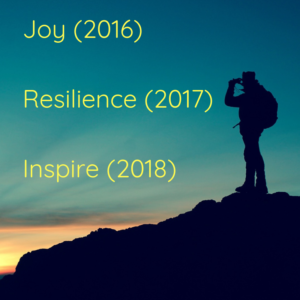 From transforming learning spaces to transforming mindsets, I’ve ventured into uncharted territory without a compass, without a guide, without the guarantee of success. It’s been a year of highs and lows. In this year of embracing change I’ve discovered a lot about myself and in the process I’ve grown in ways I never thought possible. I’ve also learned that while change is often unpredictable, it also creates opportunities that might not have existed before. 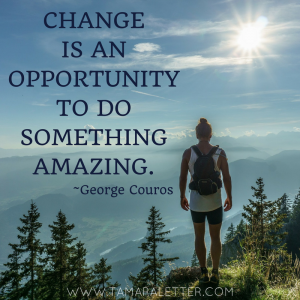 Change is an opportunity… to step out of your comfort zone and try something new. My year has overflowed with incredible eureka moments, from figuring out how to app smash green screen videos to guiding teachers and students in using programs like Flipgrid, Seesaw, and G-Suite to showcase student learning. 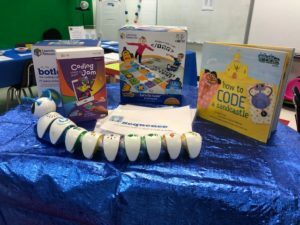 I’ve collaborated with amazing educators to dive into coding, themed days, and project based learning and discovered the true meaning of #bettertogether. Change is an opportunity… to face your fears and triumph over tribulation. Several times this year I have fallen flat on my face in a lesson, a presentation, or a conversation. In each situation I had a choice to make excuses or learn from the experience and apply that learning to making myself a better person. While the fear lingers below the surface at times, I’ve discovered just how resilient I can be when I give myself, and others, a bit more grace and compassion. Change is an opportunity… to value vulnerability and inspire others. It’s one thing to say “Failure is an opportunity to learn;” it’s quite another to discuss your failures with complete strangers as you process the learning experience. By connecting with other educators on Voxer and joining book study groups like #PathtoSerendipity, I’ve learned that I’m not alone when those trees block my view. There’s always another hiker who has climbed the same mountain with tips on how I can reach the summit, too! Change is an opportunity… to discover your passions and your purpose. For the past six years I have traveled a path of sharing kindness with others, but not always in the public eye. 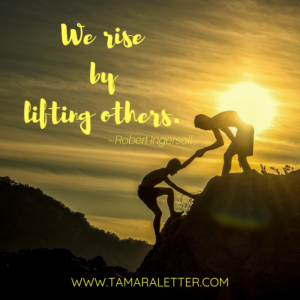 This was the year I decided to “cannonball in” as Tara Martin describes and embraced my calling as a writer, a kindness cultivator, a champion for all things good. 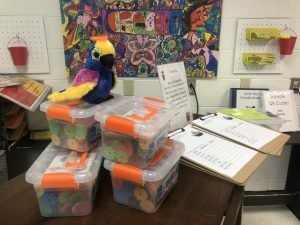 I brought my passion for kindness into the classroom, collaborating with teachers on kindness lessons and passion projects, then climbed even higher to welcome news crews into our learning space, knowing that every story that is told is one more seed of kindness planted in this world. 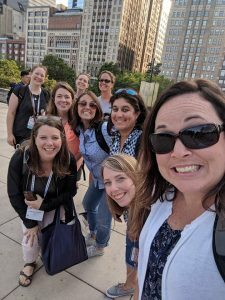 As we wrap up our final week of school, I reflect on all the different ways I have been impacted by change this year and I’m simply astounded. I never knew I was this strong. I never knew I was this determined. I never knew I could be so brave. Change has been, and always will be, a constant in our lives. How we choose to embrace change is what sets us apart from others. Will we walk safely on the trail below seeking shelter from the storms or will we hike to the summit to watch the sunrise of a new dawn appearing above? I’m lacing my sneakers and choosing the hike. How about you? 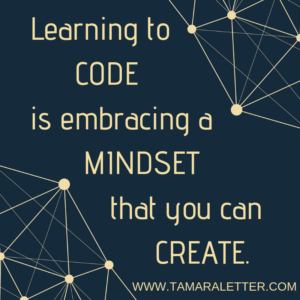 We have a whole summer to ponder the possibilities and shift our mindsets for growth. Won’t you join the journey with me, too? 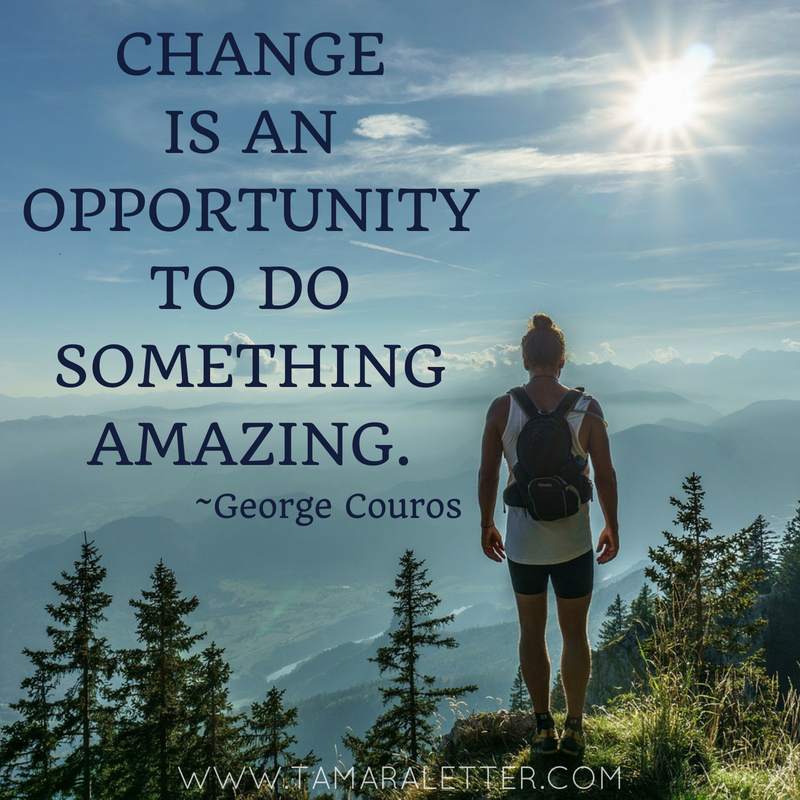 In the words of George Couros, change is an opportunity to do something amazing! What are we waiting for? Let’s go! 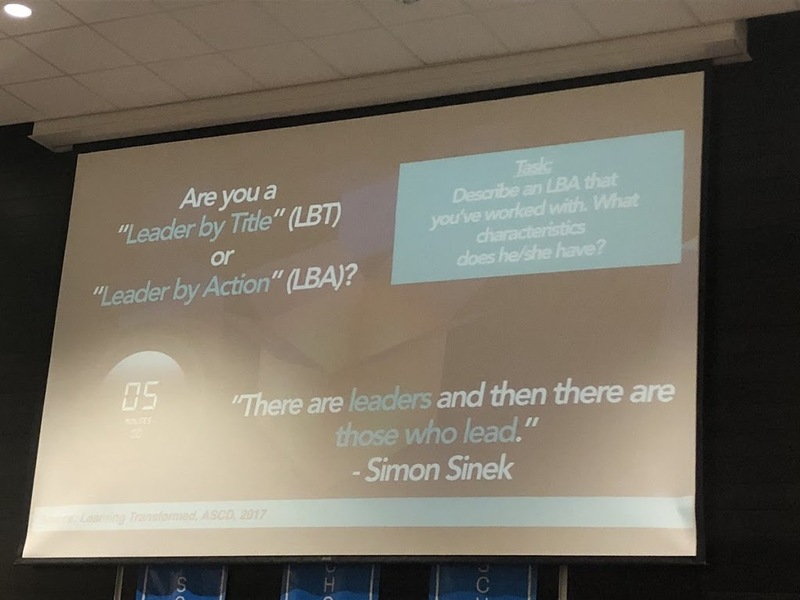 One of the slides in his presentation lingered with me throughout the week and gave me pause: Am I a Leader by Title or a Leader by Action? 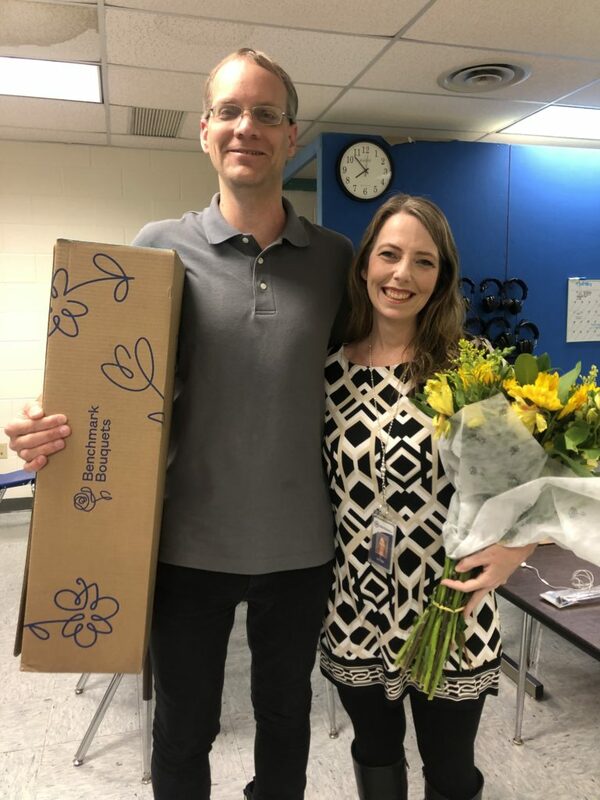 Just last month I added another title to that list: Mechanicsville Elementary Teacher of the Year. Each title has its own set of qualifiers and each is prominent in its own right. But does a title alone make me a leader to inspire others to learn more, dream more, become more? Leaders by Title rely on the history of their position to set the trajectory of their path. Their title affords certain privileges automatically and they work within these parameters. They usually have other people who fall under their realm of management and dutifully provide direction to set the course ahead. 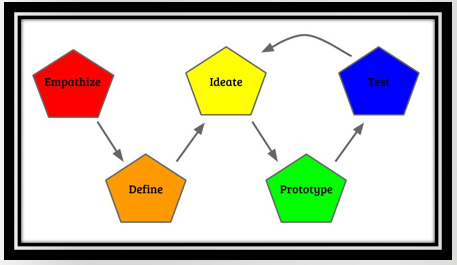 The work gets done, and often done well, but when the task is complete the work ends. Personal growth is not a priority from a task that is guided by a Leader by Title. There are some Leaders by Title who take their position to the extreme and abuse the automatic rights given to their position. They invoke fear in others to get the work done or, even worse, dictate the mandates for work then take all the credit, never offering so much as a “thank you” to those who gave of their time, energy, and knowledge. These types of leaders are the ones who unknowingly undermine culture, making rifts that eventually split and divide. Leaders by Action create their own legacy. While their role specifies the path, each day is defined by what they do and whom they serve. They are willing to get in the muck and the mire with others and redefine their role depending on circumstances that arise. They uplift. 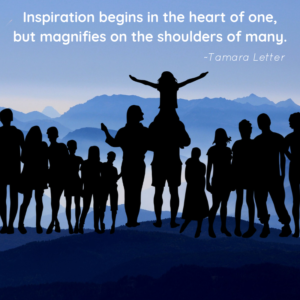 They inspire. They empower. They model true leadership for others and encourage them along the way. They celebrate the accomplishments of others and give credit where credit is due. Yesterday I attended our district’s Arts & Science Festival, an annual celebration of the amazing work the students in our district create through the year. This event is a long-standing tradition in our community and for those who have lived here a long time, it becomes a family reunion of sorts. No matter where you walk, you will most likely see a familiar face smiling back. This event would not be possible without the tireless dedication of many Leaders by Action. 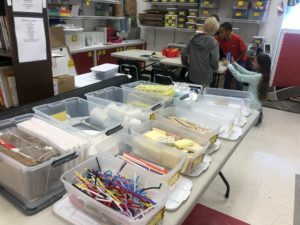 Dozens of teachers and administrators have spent the past few weeks compiling student projects, printing labels, creating personalized letters for parents, all in preparation for this event. Some spent late nights double-checking digital projects, making sure nothing was misspelled and all the links were active. 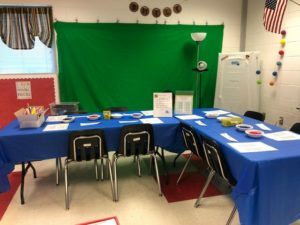 Friday afternoon, those same volunteers delivered all the projects to one location, set up displays, taped artwork to walls, and created interactive areas for independent exploration. From the hours of 10:00 am to 4:00 pm, Leaders by Action arrived and volunteered their time (on a Saturday!) to do the work that most definitely didn’t align with their role as a Leader by Title. They greeted guests at the door with a smile. They distributed maps of the school and guided parents to student projects. They arrived early to practice with students before their performances. They walked the halls and interacted with guests. They were visible. They were smiling. They showed us by their actions the joys of servant leadership. 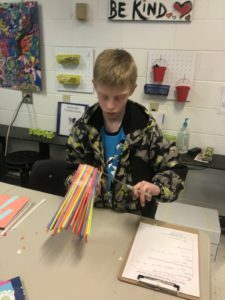 Since my youngest son had a soccer game that morning and my oldest son had plans for the afternoon, we went to the Arts & Science Festival in the middle of the day. I was there as a mom, but as many of you know, we never quite lose our “teacher title” when out in public. Both boys had projects displayed in the festival, so we meandered through the school, enjoying the work of other students as we walked. We were awestruck by the gallery of greatness displayed by so many students in our district. As we made our way back to the main lobby, I saw one of my students running towards me. The smile on her face could light up a room and the surprise in her voice when she caught my eye was priceless. She embraced me in a hug and turned her head to call to her mom. It’s a title I never included in my list because, up until that moment, I hadn’t even considered it a possibility. Her final comment made me laugh out loud. It also made me realize what title I hold in this little girl’s heart. 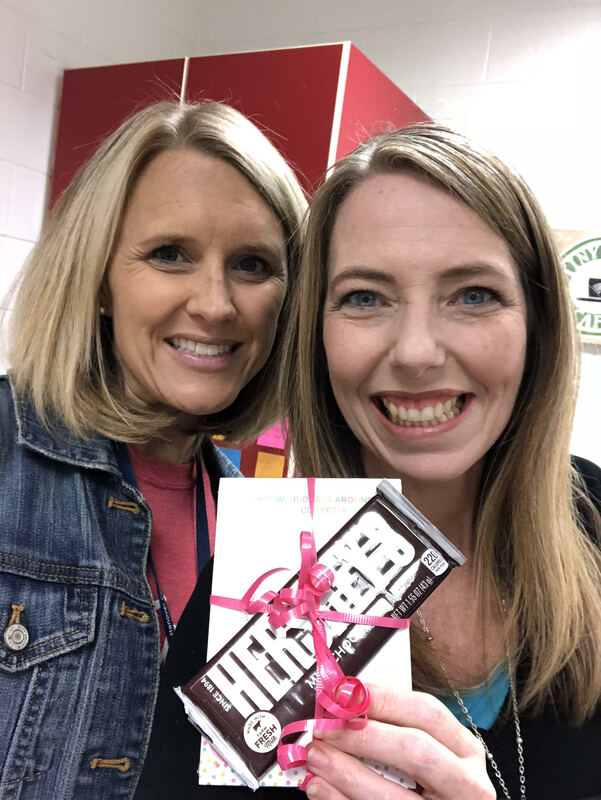 Being the “kindness teacher” ranked higher than my title of technology integrator, one I’ve proudly held for the past ten years. 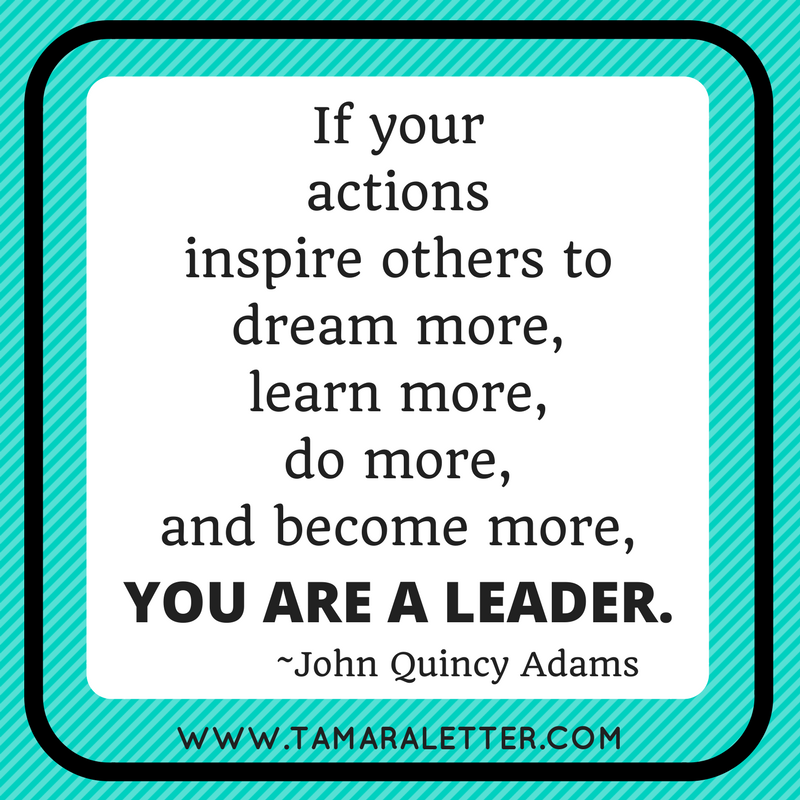 Let us all embrace the qualities of a Leader by Action and redefine our role to others. Don’t allow your title to limit your potential for greatness! Shine in your skills and inspire others with words and actions each day! 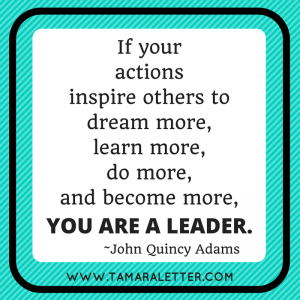 Each and every one of us can be a Leader by Action – dive in and lead the way!